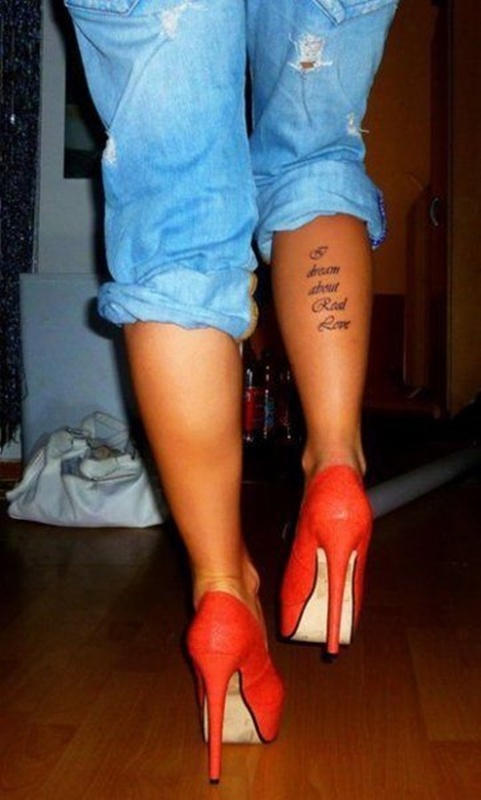 The calf is a great place for a tattoo because it can be easily displayed or easily concealed depending on the occasion. 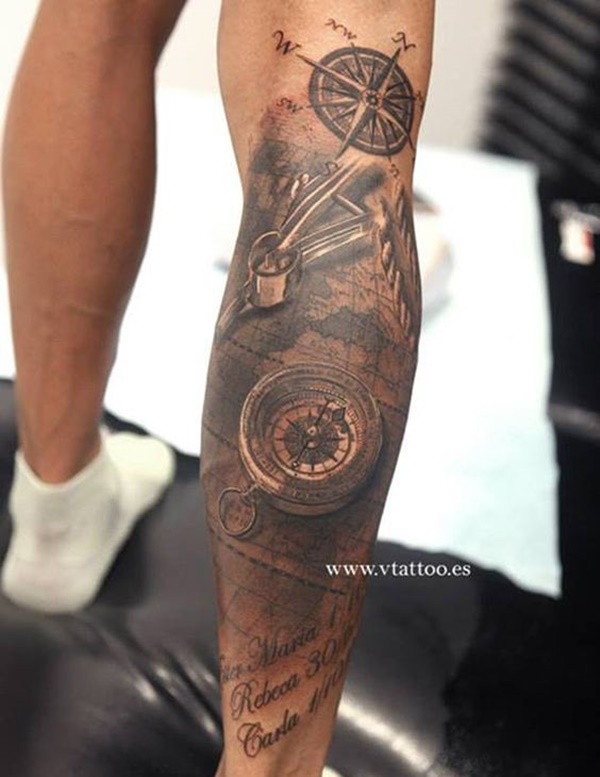 As leg sleeves grow in popularity we are beginning to see leg tattoos compete with the reigning tattoo location champion, the arms. 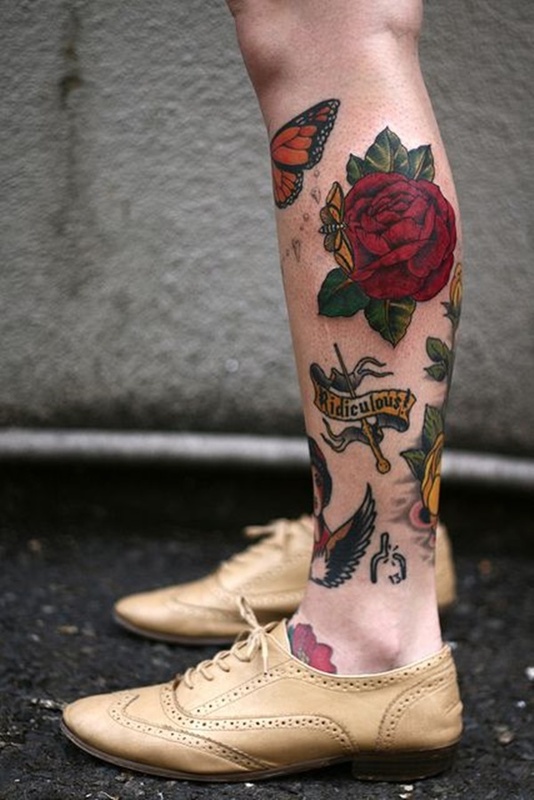 This article presents you with a myriad of calf tattoos to stimulate your creativity, read on and enjoy. 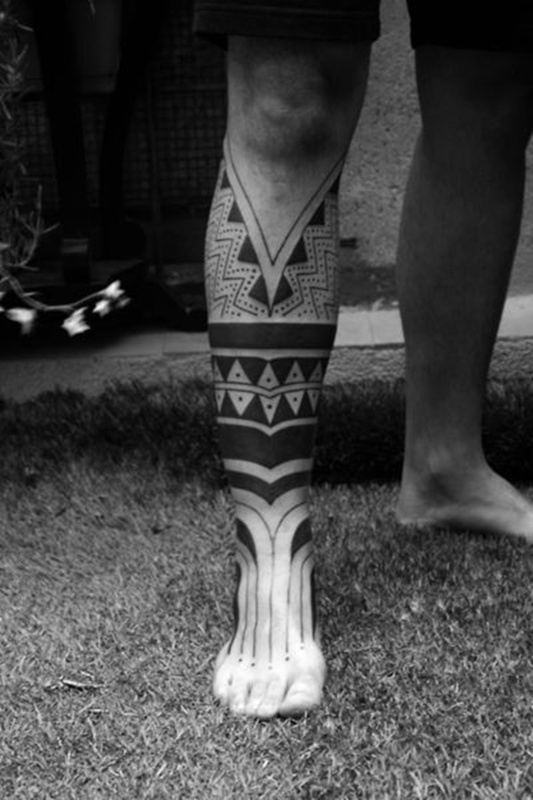 This black, calf-length tattoo uses elements of a Hawaiian Tiki to create the image. 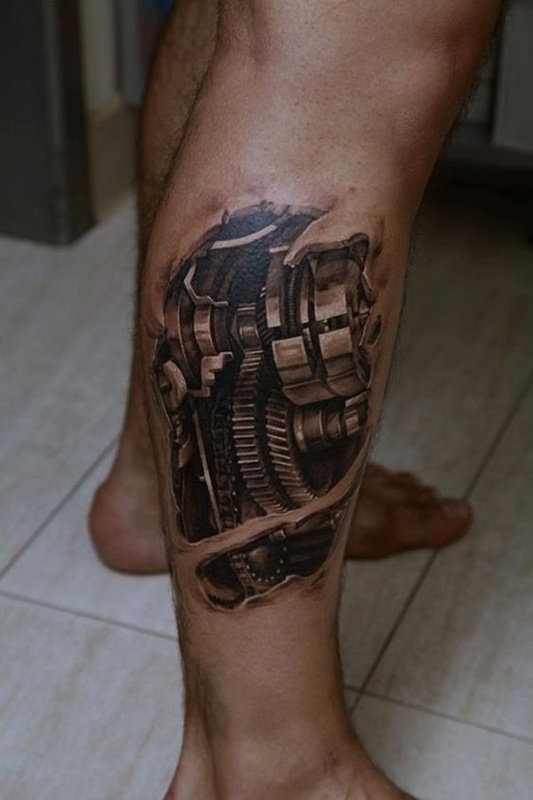 This hyper-realistic tattoo shows a group of gears sitting beneath the wearer’s torn flesh. 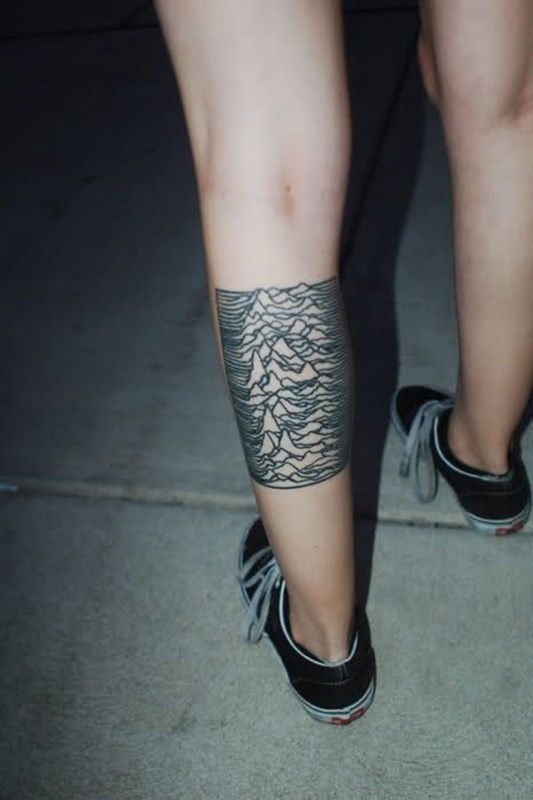 The tattoo is depicted in black, gray, and white ink. 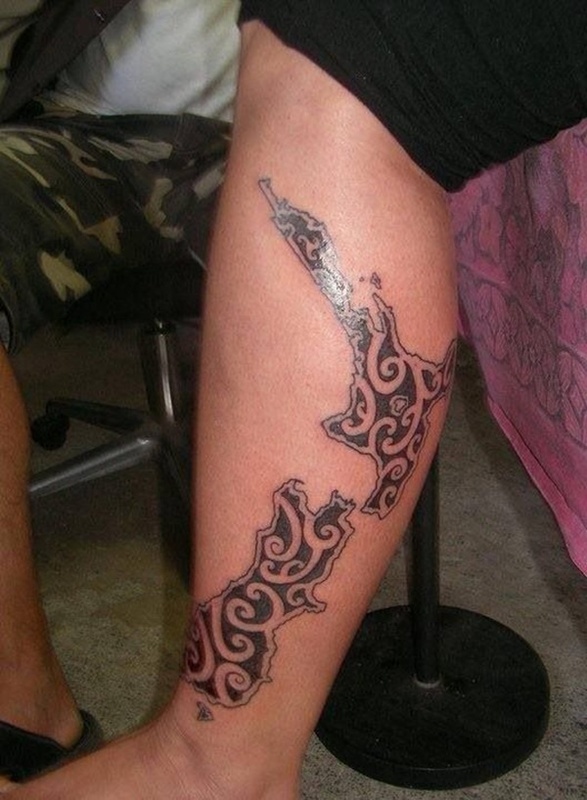 Black ink is used to create a topographical map on the wearer’s calf in this tattoo. 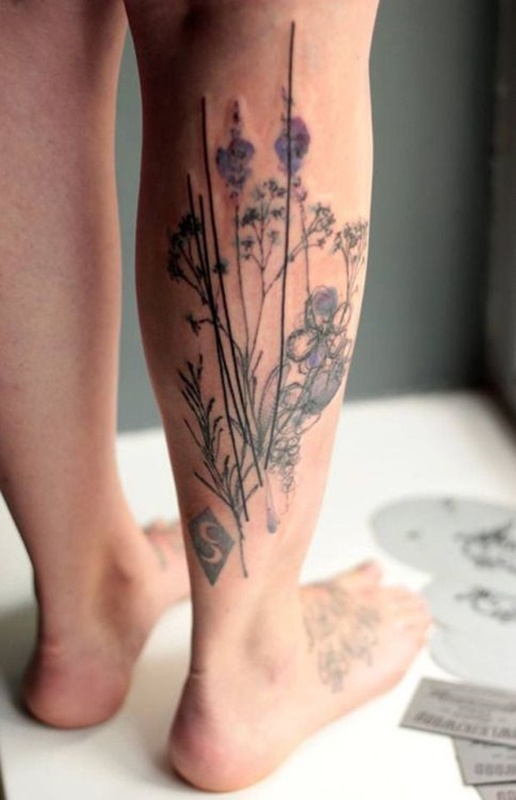 Black arrows with flowers replacing the feathers adorn the wearer’s Achilles’ heel in this tattoo. 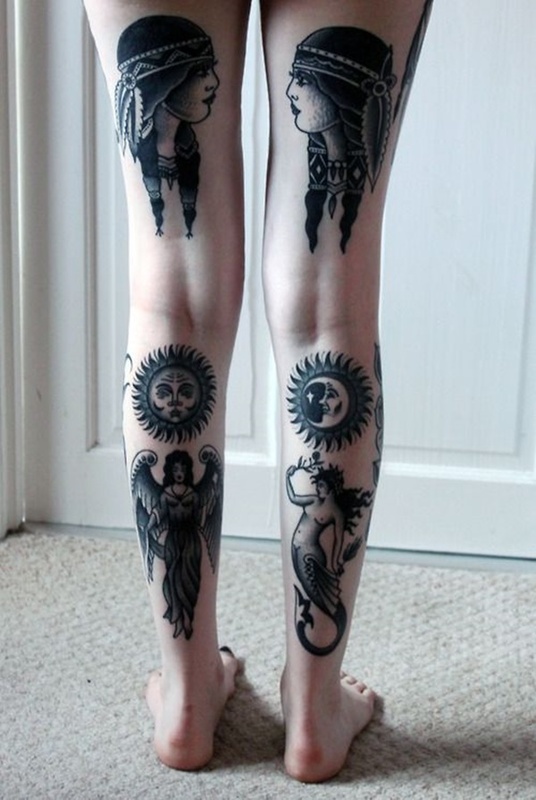 Three tattoos adorn each leg in these tattoo sets. While the pieces aren’t terrible I think it’s important to point out that the images are too heavily shaded and details are washed out as a result. Boldly outlined geometric shapes are connected by a series of interweaving lines. 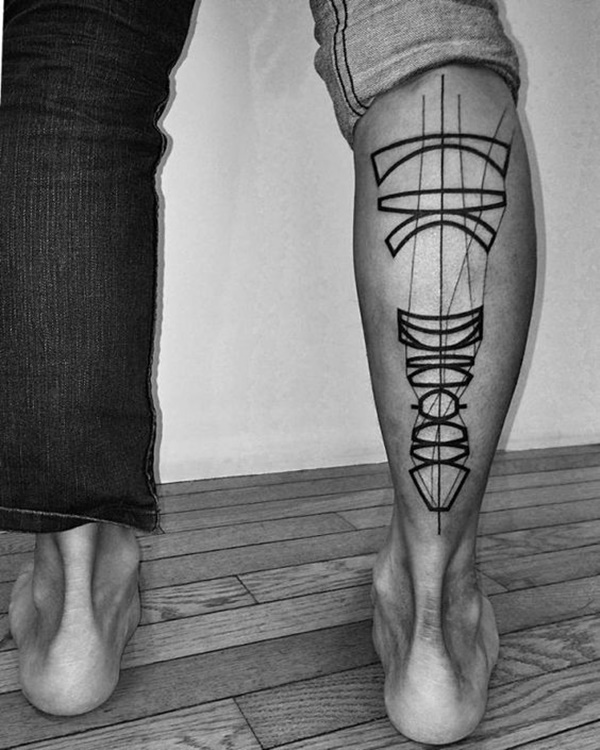 This tattoo utilizes black and gray geometric shapes connected by black and red lines on the back of the wearer’s calves. 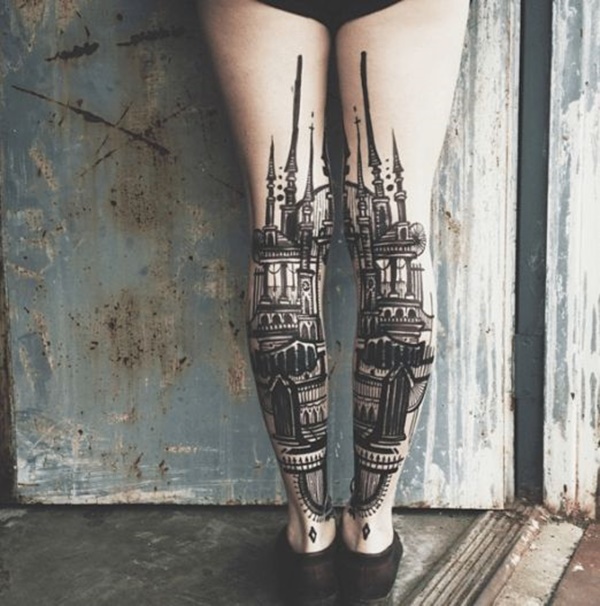 This black and gray tattoo depicts a Gothic style building spanning across the wearer’s calves. 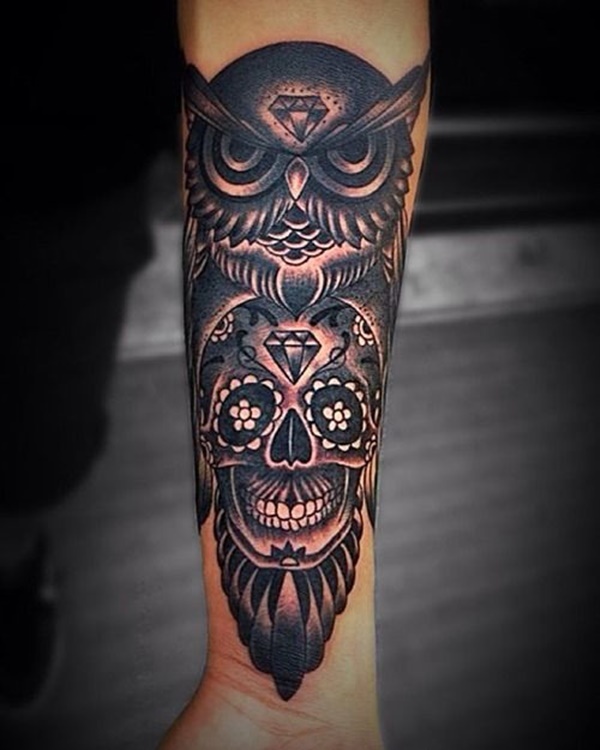 This beautifully detailed black and gray tattoo shows a stylized owl sitting atop a skull embellished with day of the dead designs. 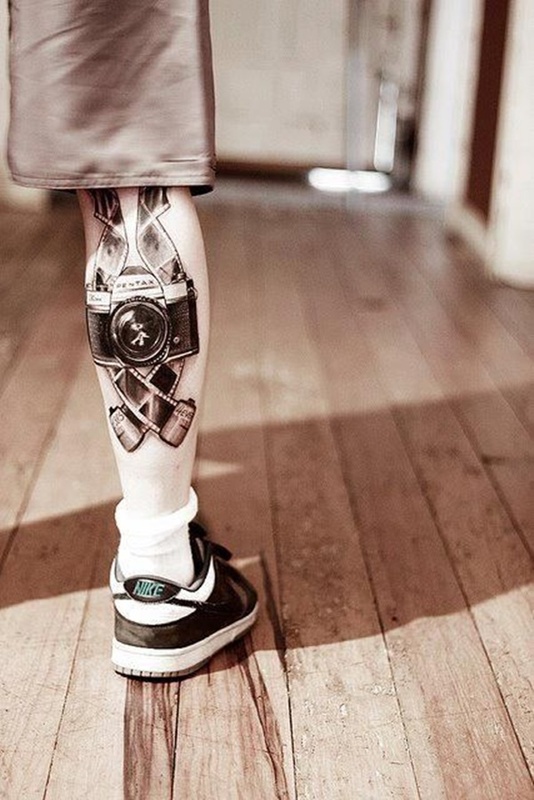 This hyper-realistic tattoo creates an analog Pentax camera using black, gray, and white ink. 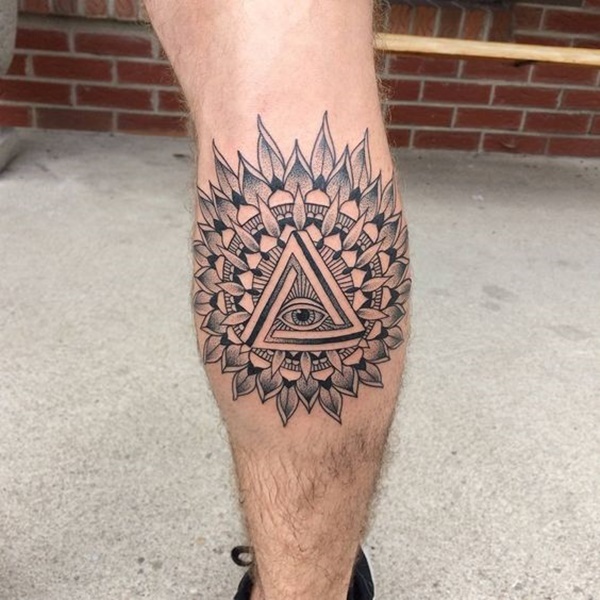 This black and gray tattoo uses elements of mandalas and peacock feathers while an all seeing eye encapsulated a triangle functions as the centerpiece. 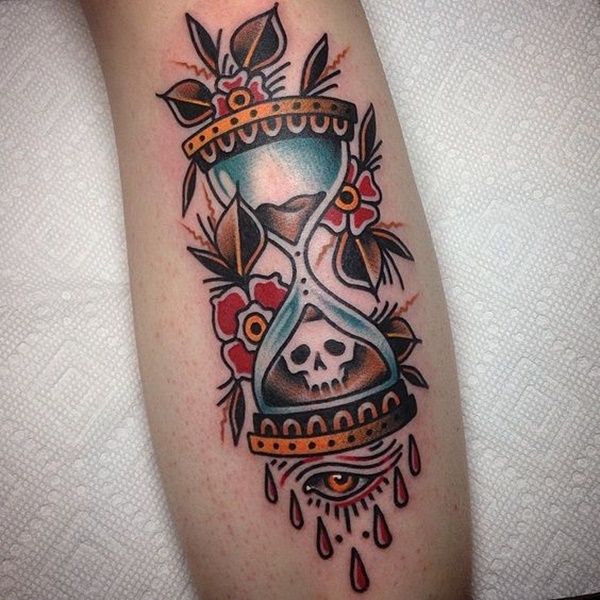 Traditional styling and coloring is used to create an hourglass with a skull in the bottom surrounded by blood drops, flowers, and an eye. 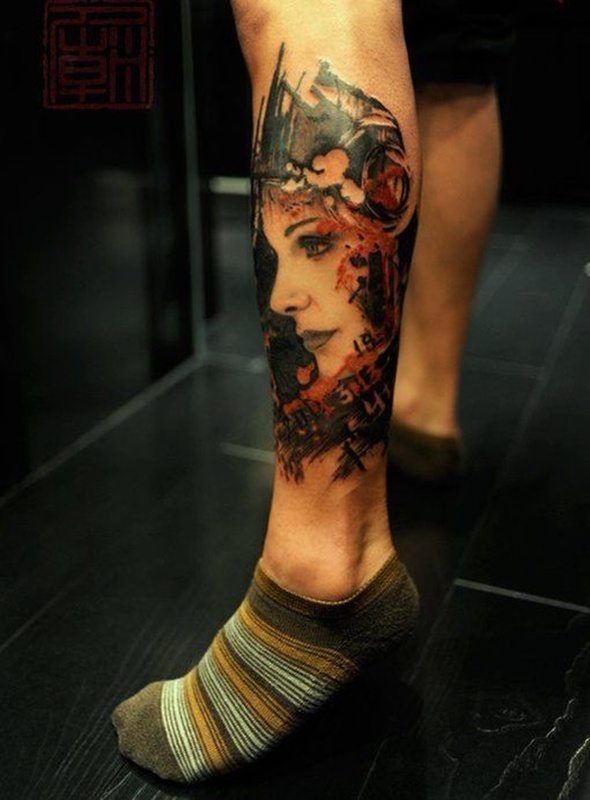 A black and gray profile portrait of a woman is embellished with flowers and scrolls in this tattoo. 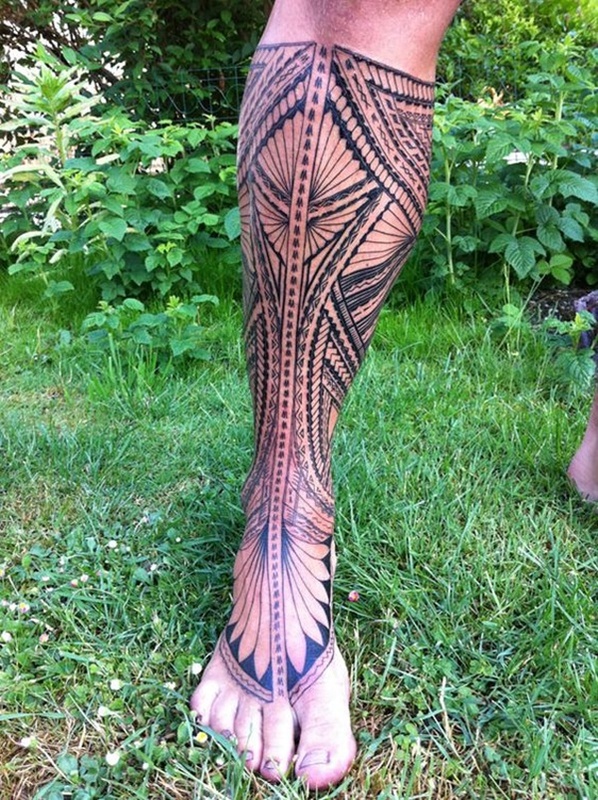 Tribal inspired designs are depicted in black ink in this piece. 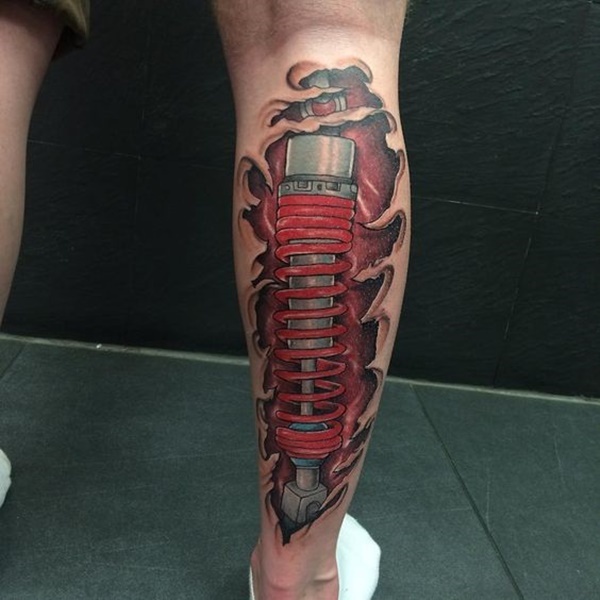 A shock, as seen on a motorcycle, is depicted underneath the wearer’s torn flesh in this tattoo that depicts the mechanical part in red and gray ink. 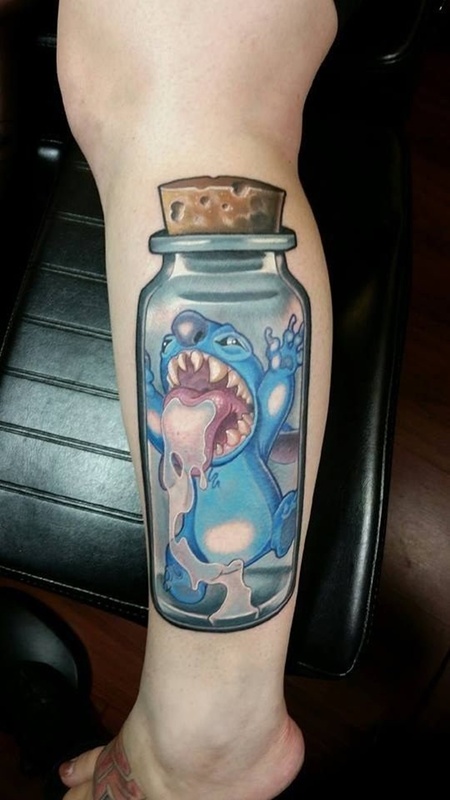 Stitch, from the famous Disney movie Lilo and Stitch, is depicted trapped inside of glass jar. 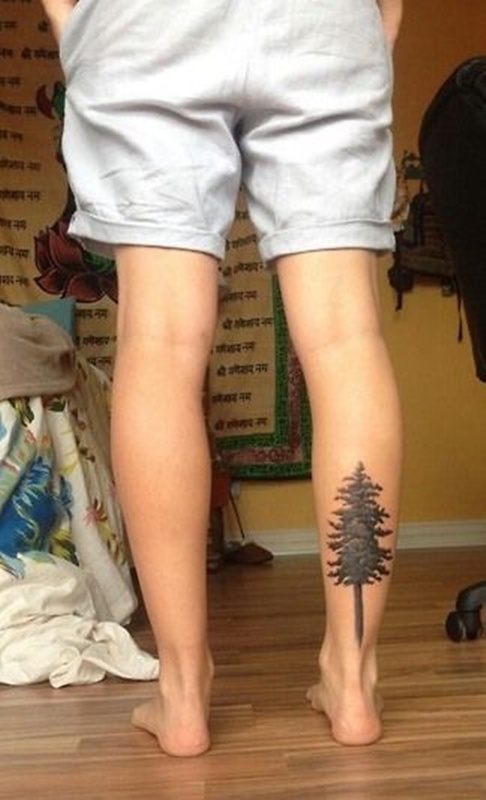 A black and gray pine tree is depicted on the wearer’s calf. 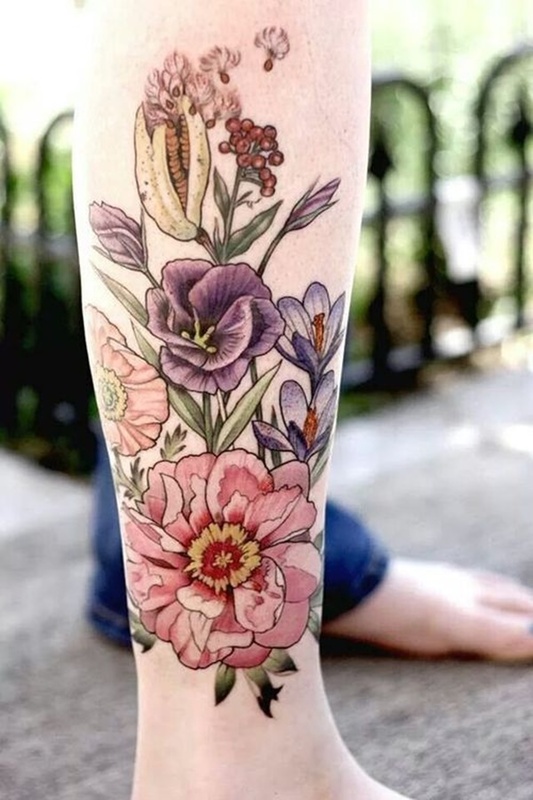 A full color depiction of a group of wildflowers is illustrated wrapping around the wearer’s shin and calf. 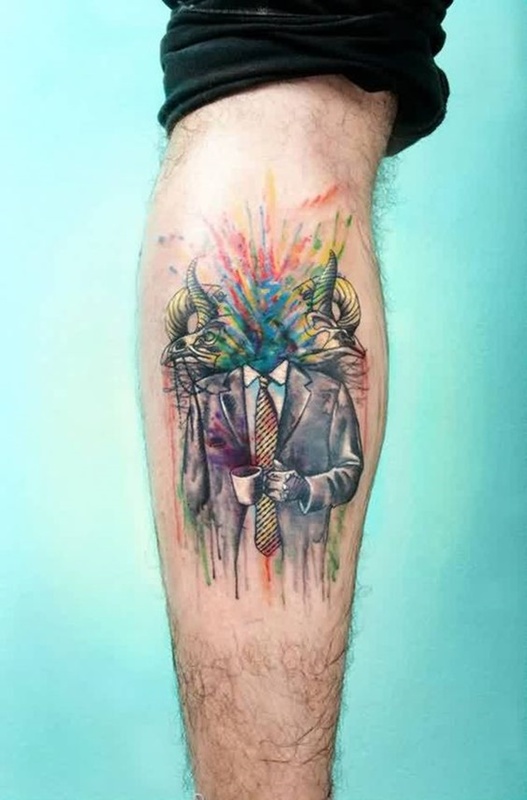 A headless suit is illustrated with a burst of watercolors spurting from the neck hole while the watercolors are flanked by goat skulls in this imaginative piece. 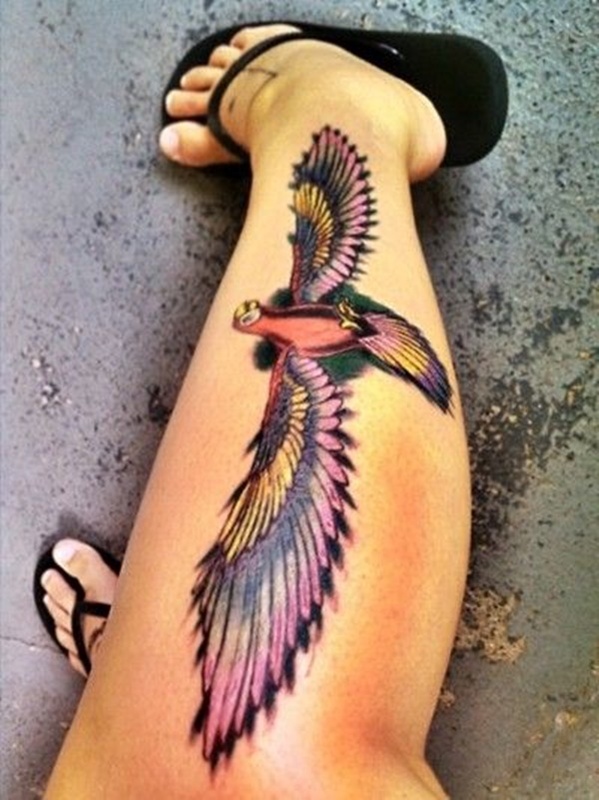 An array of feathers are illustrated in full color in this calf tattoo. 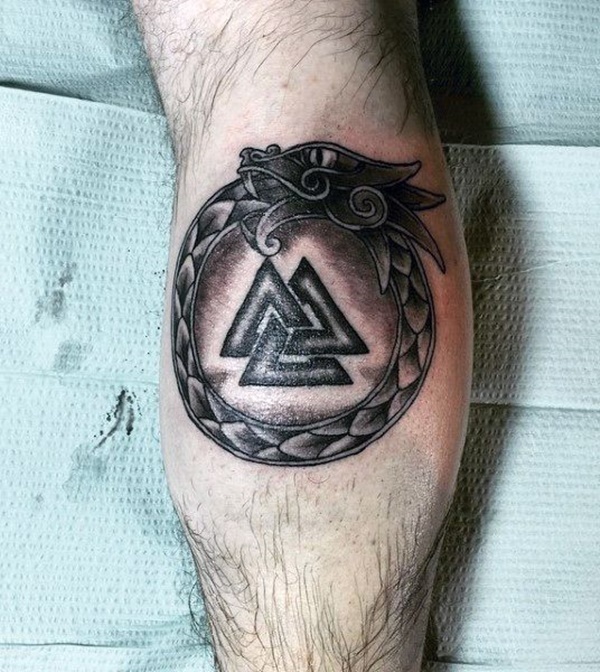 A trio of interweaving triangles is framed by a dragon eating its tail in this black and gray tattoo. Negative space is used to create scroll designs between series of shaded curves. 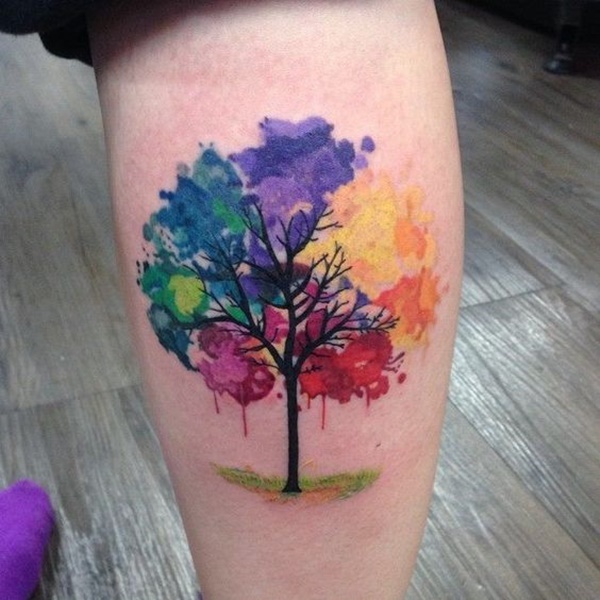 A black tree silhouette is adorned with watercolor smudges in lieu of leaves in this watercolor piece. 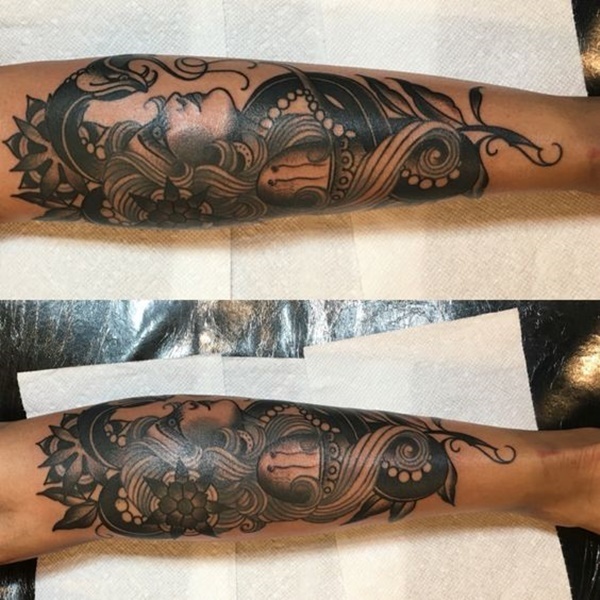 A compass is embellished with black ink spots and a fleur-de-lis in this tattoo. 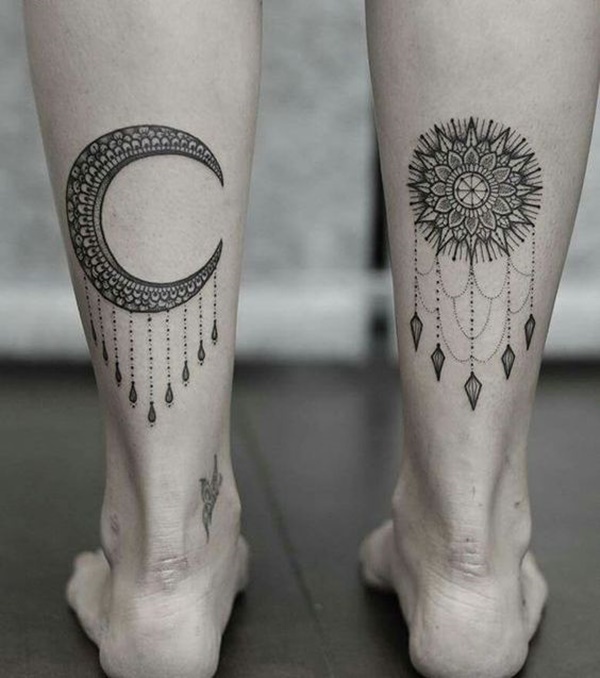 A sun and moon are detailed with mandala elements in this black tattoo set. 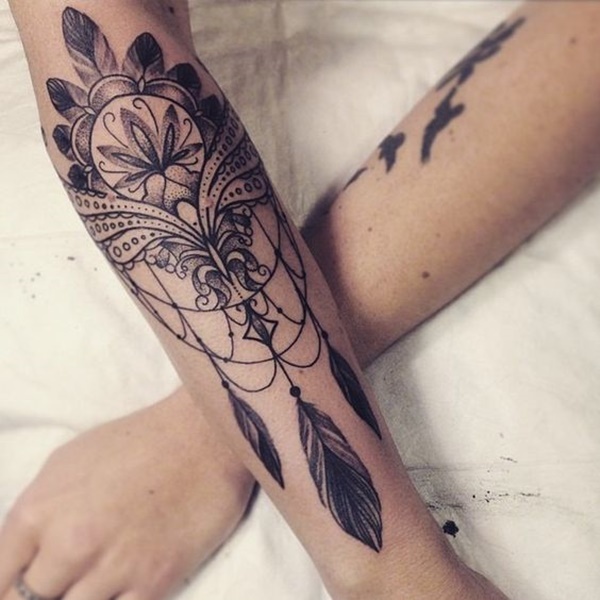 This black and gray tattoo utilizes elements of dream catchers and mandalas to create a unique piece. 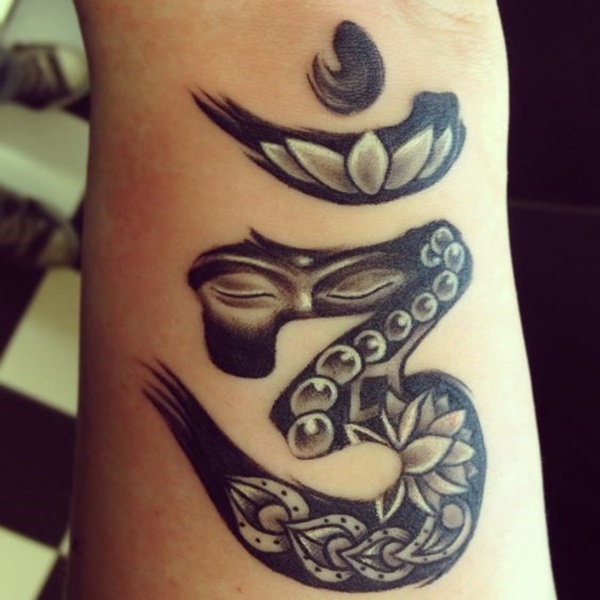 This black and gray Om symbol is embellished with lotus flowers and the closed eyes of an Indian goddess. 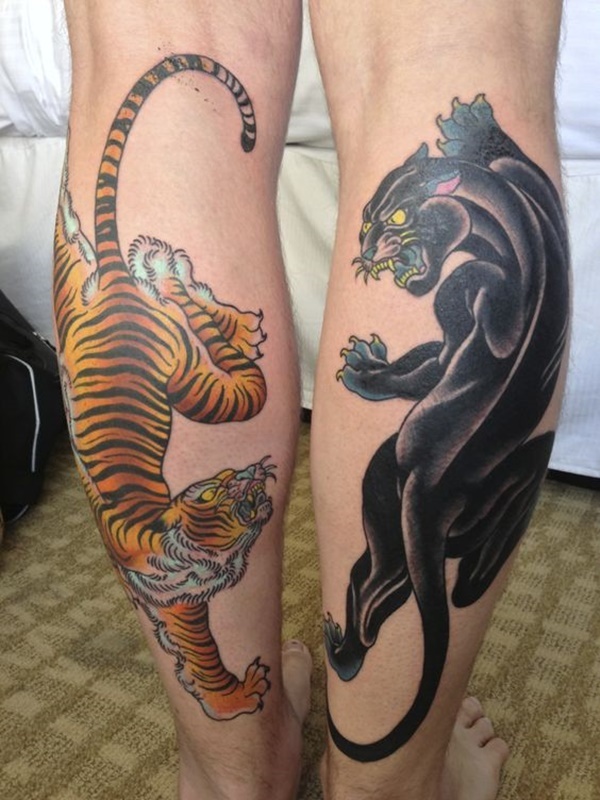 A tiger and a black panther are illustrated in a traditional style on the back of the wearer’s calves in this tattoo set. A traditional Japanese depiction of a wave functions as the background of this piece while pink flowers fill the foreground. 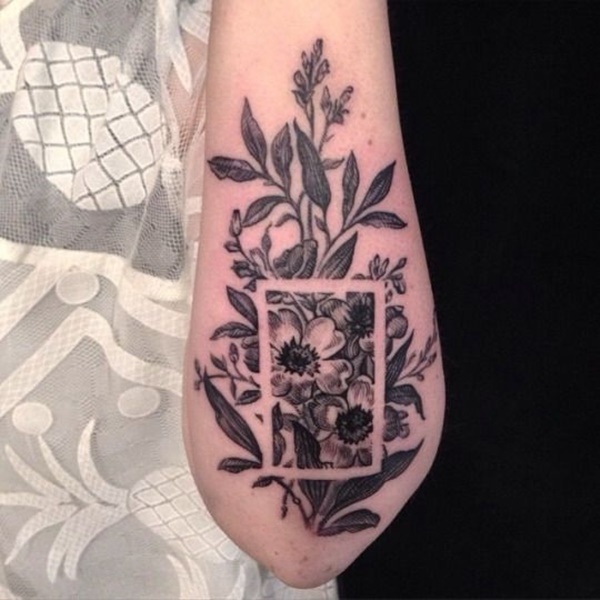 A rectangle created using negative space functions as the centerpiece of this tattoo that depicts an array of black and gray flowers. 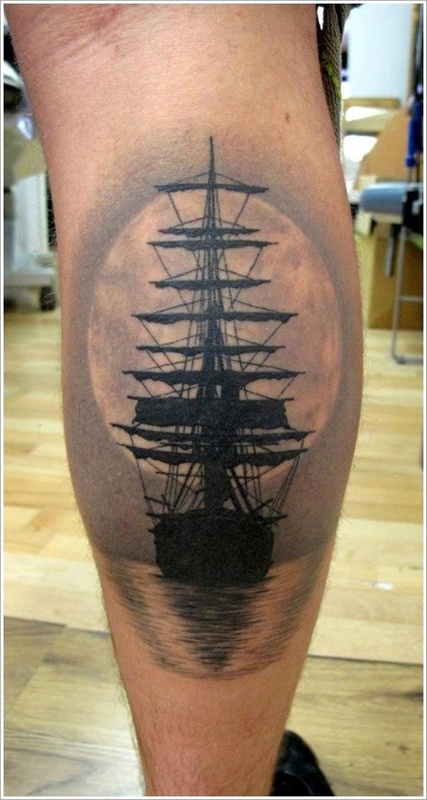 The silhouette of a ship sailing toward the moon is rendered in black and gray. 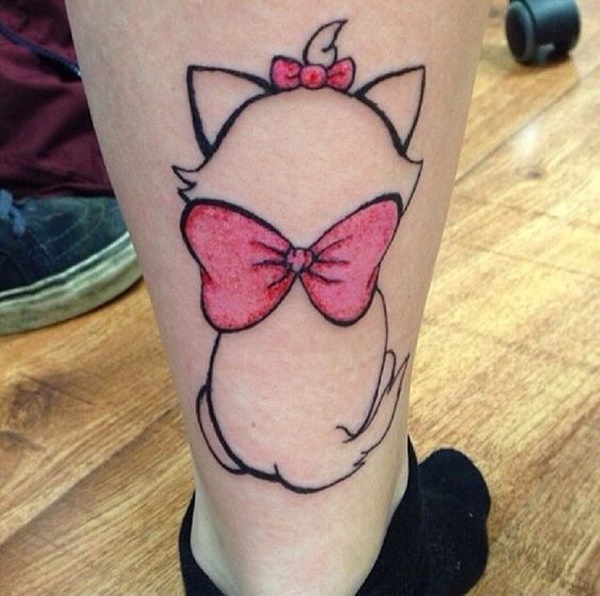 A seated cartoon cat is illustrated with a large pink bow around its neck. 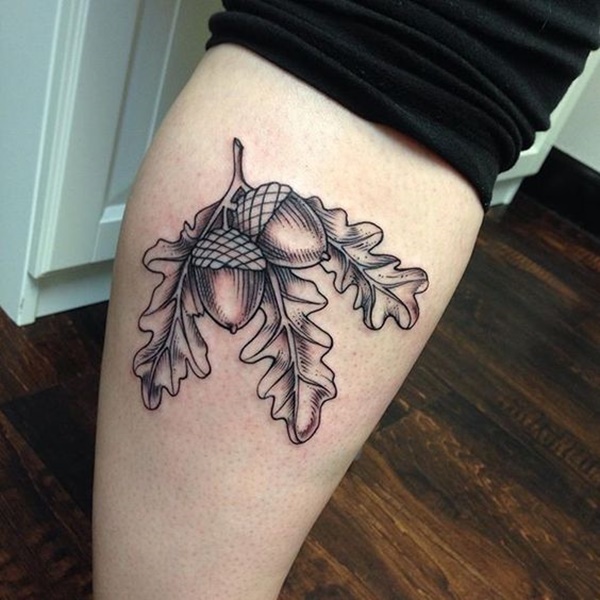 A pair of acorn and a trio of leaves are rendered in black and gray. 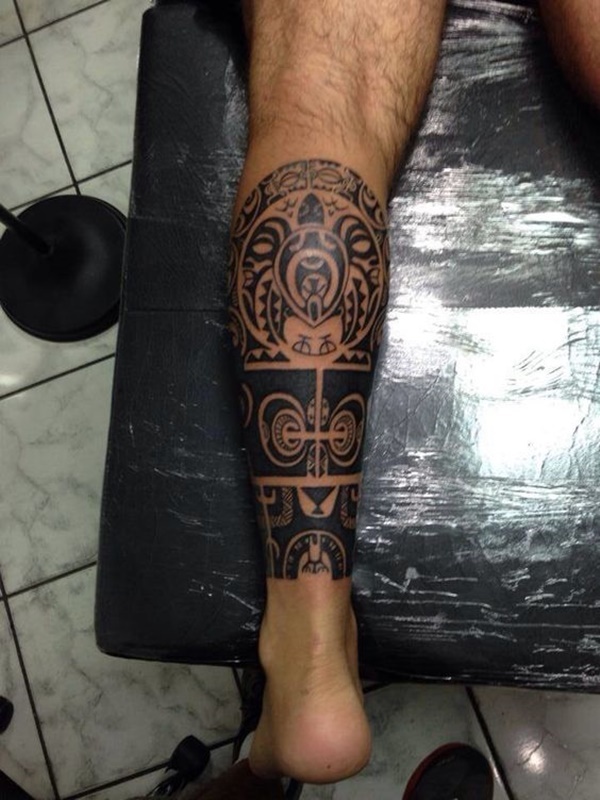 An interweaving tribal design is depicted in black ink. 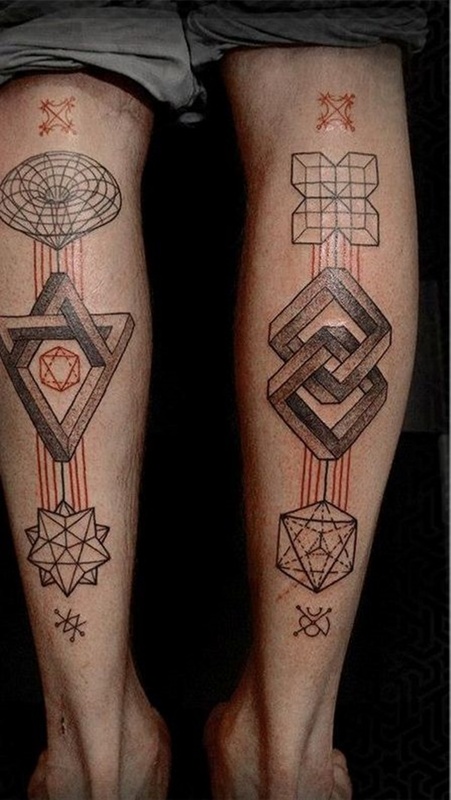 A series of triangles are depicted in a sketch style and embellished with colors around their outlines. An ornate flower is created using a palette of black and green. 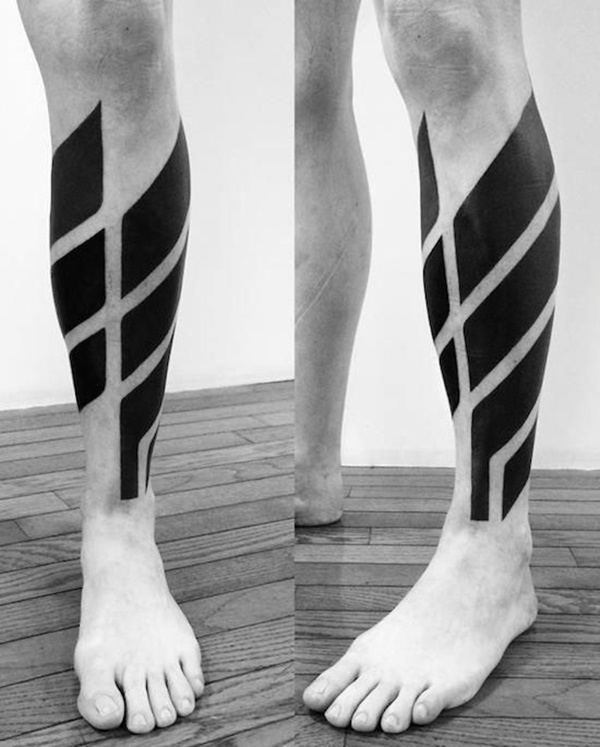 Black bars wrap around the wearer’s calf to create a sleeve. 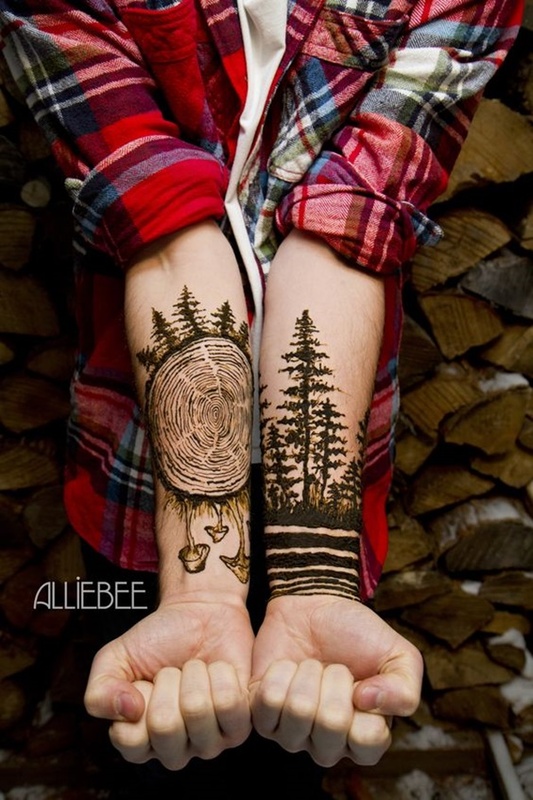 A landscape is encapsulated in a small rectangular band wrapping around the wearer’s forearm. 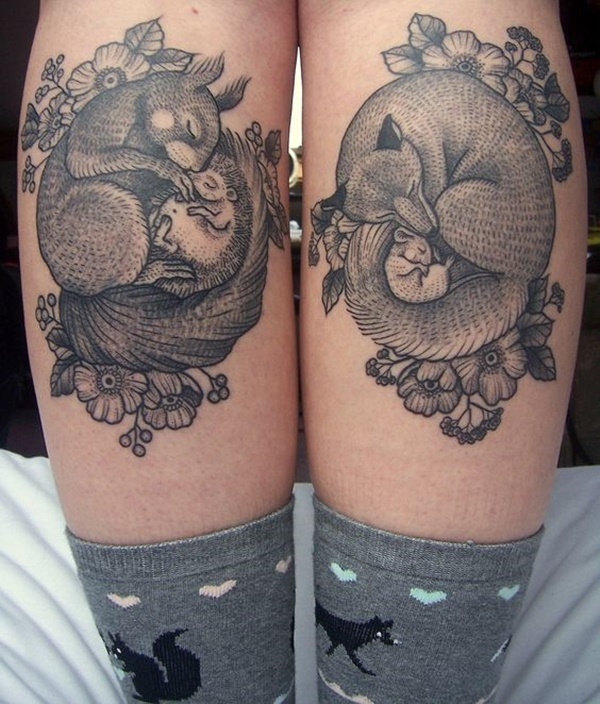 A squirrel cuddling a hedgehog and a fox cuddling a mouse are depicted on the wearer’s calves. Both pieces are surrounded by flowers. 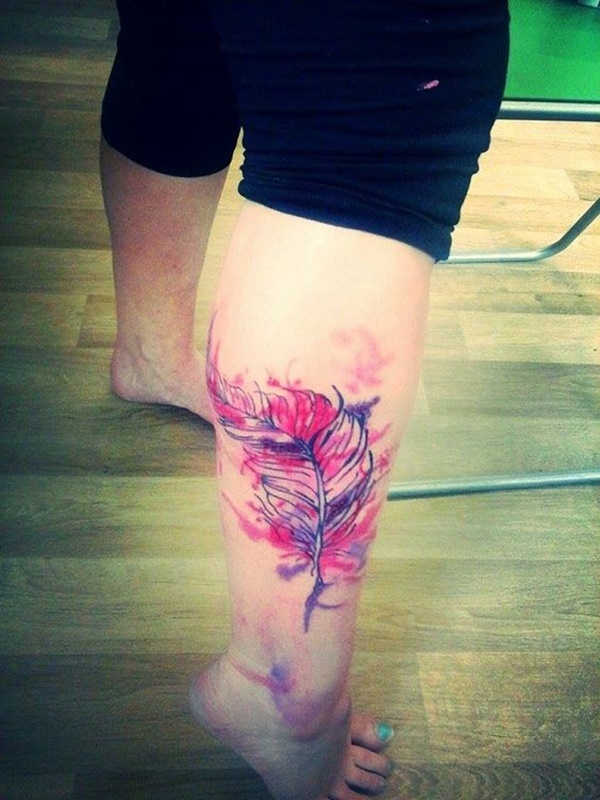 A feather is accented with watercolors utilizing a pink and purple palette. 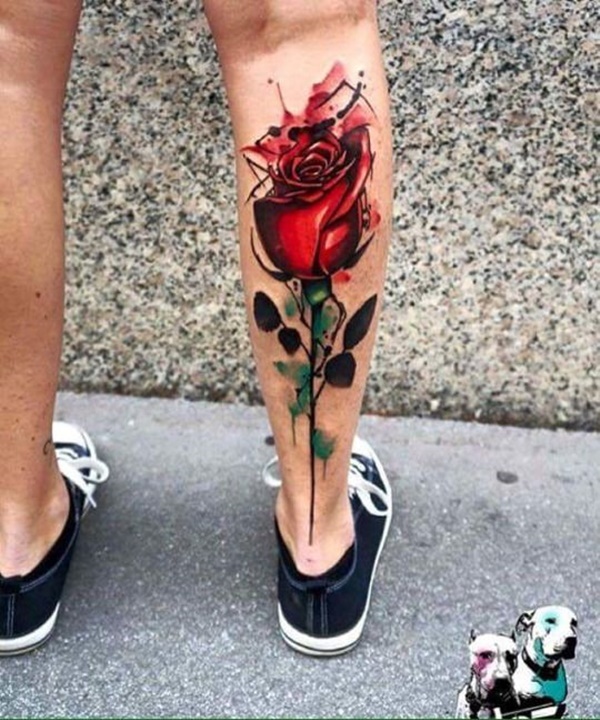 A stylized rose is depicted in full color and accented with paint runs. 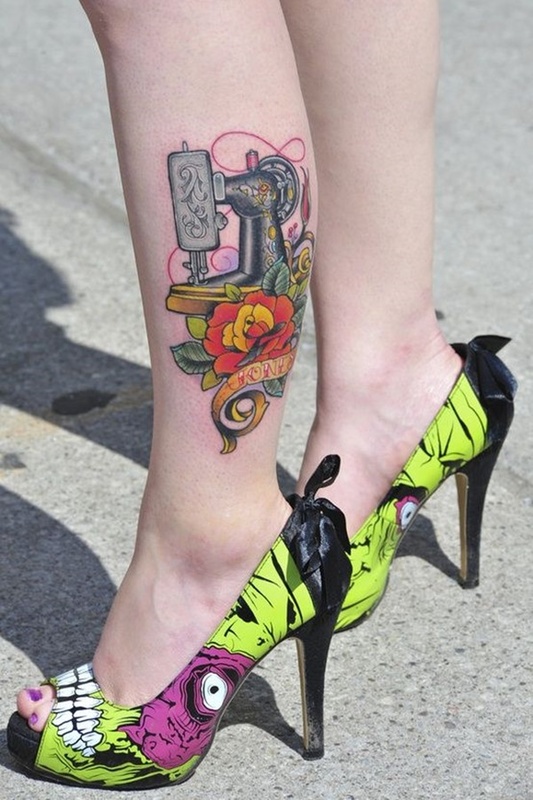 An antique sewing machine is accented with a flower and a banner. 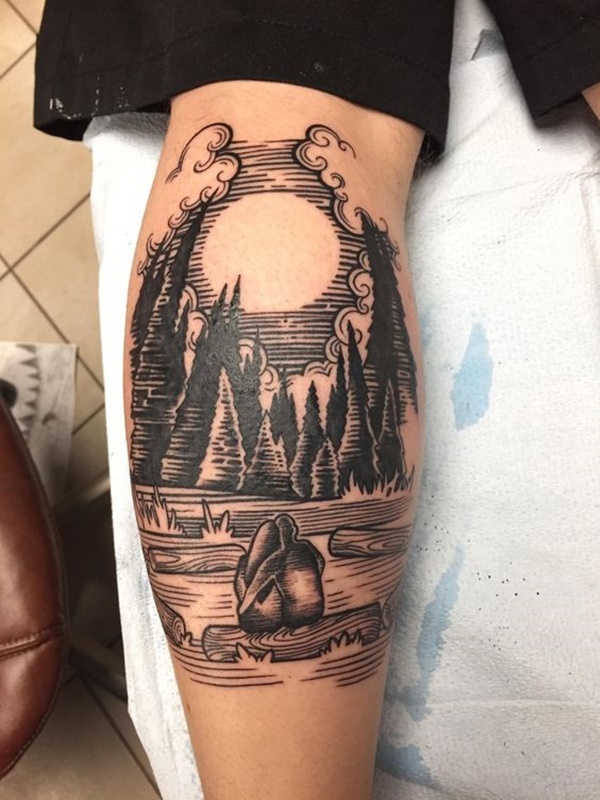 The quote, “I dream about real love,” is depicted in a black script font in this tattoo. 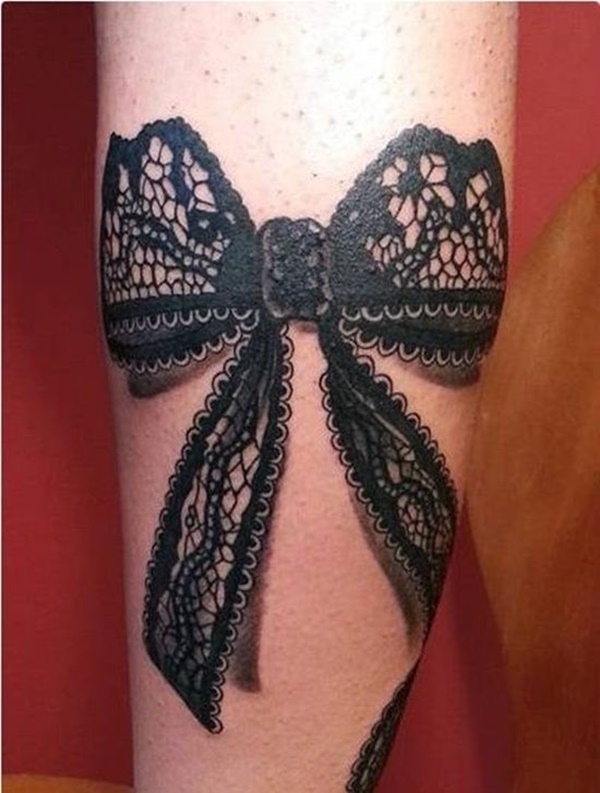 A black lace bow is rendered in this tattoo. 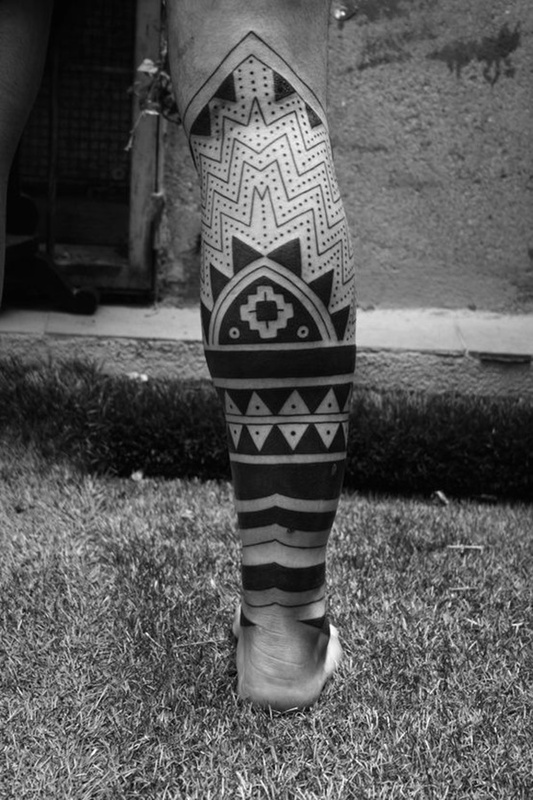 An Aztec inspired design is used to create this calf sleeve. 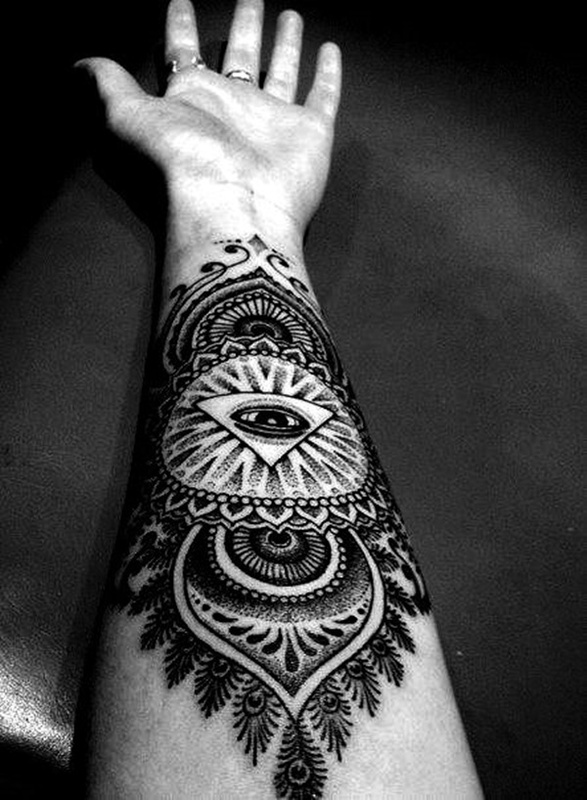 An all seeing eye functions as the centerpiece of this black and gray mandala. 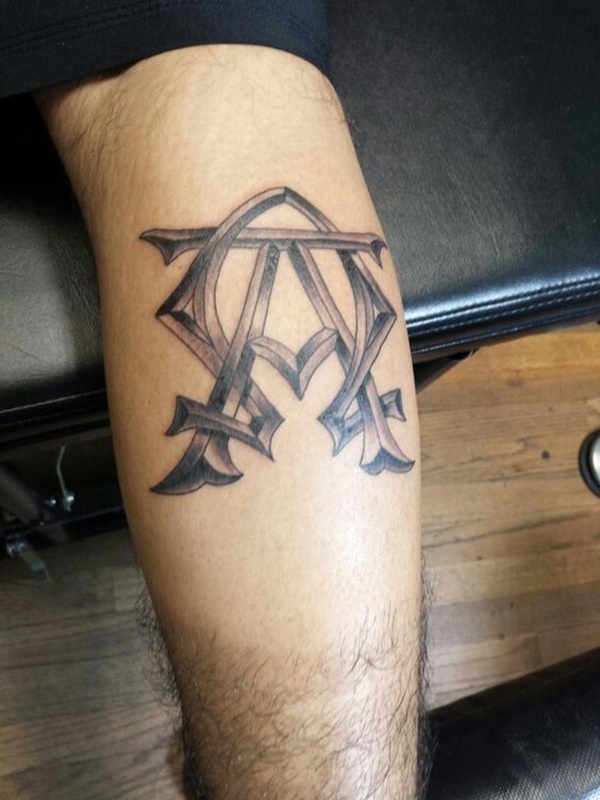 An alpha and omega symbol are interwoven in this black and gray tattoo. 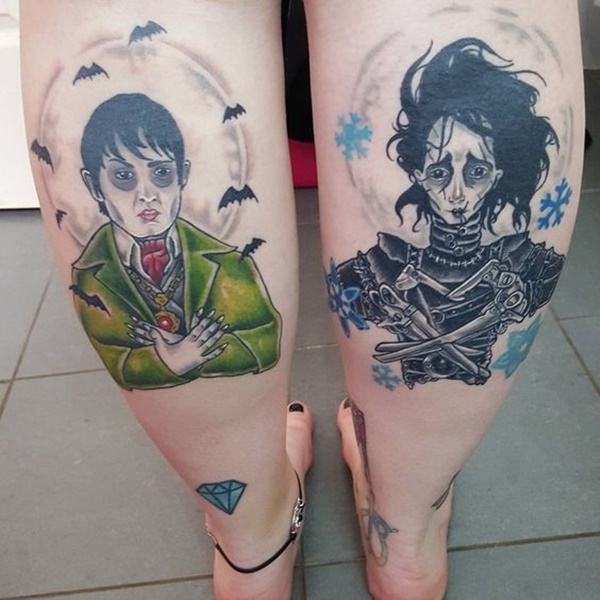 A pair of characters played by Johnny Depp including Edward Scissorhands and Barnabas Collins are rendered in this tattoo set. 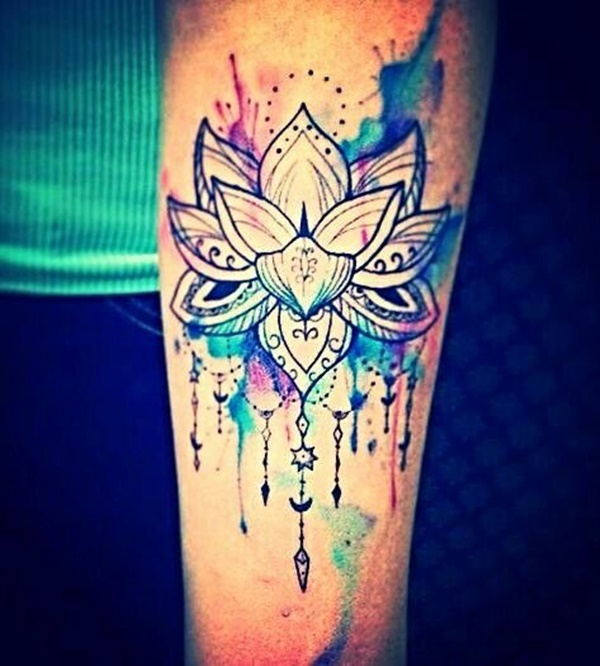 A lotus flower is accented with watercolors and strands of beads holding crescent moons. A colorful parrot is depicted with spread wings over a green background. 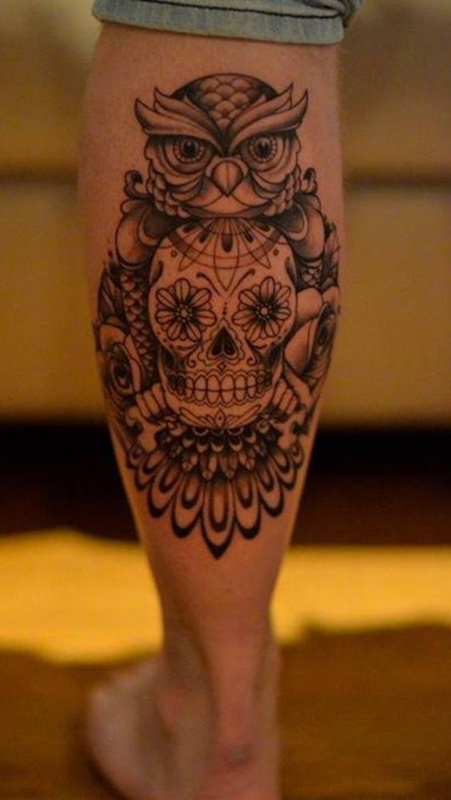 A skull is embellished with traditional day of the dead designs and is accompanied by a rose. Black tree silhouettes accompany an elaborate band. 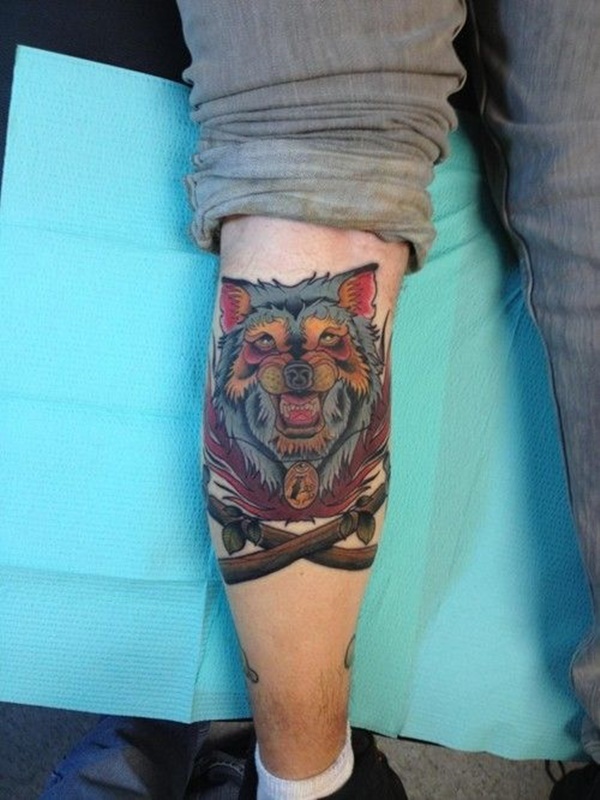 A myriad of images adorn the wearer’s calf. 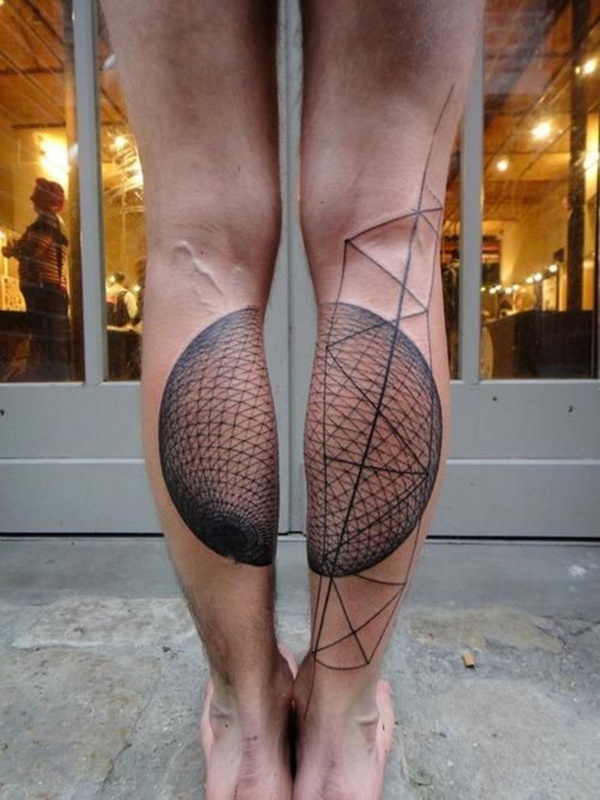 A black halved sphere is illustrated on the wearer’s calves. 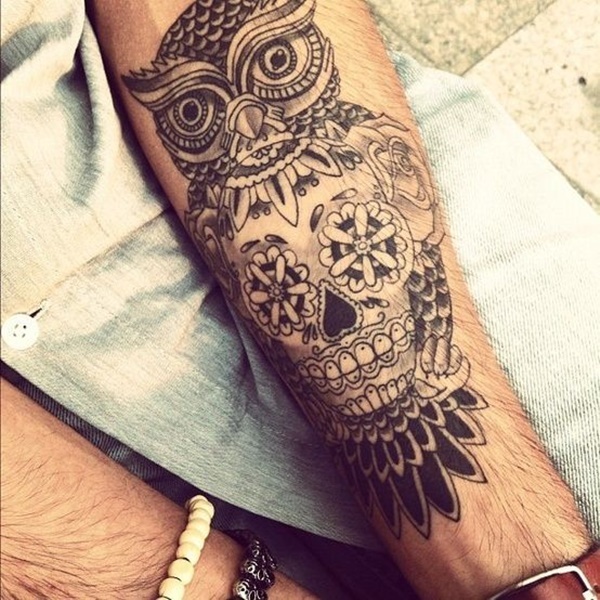 An elaborate owl and skull are depicted in black and gray. Colorful portraits of a vampire and a character with a heart for a head are seen here. 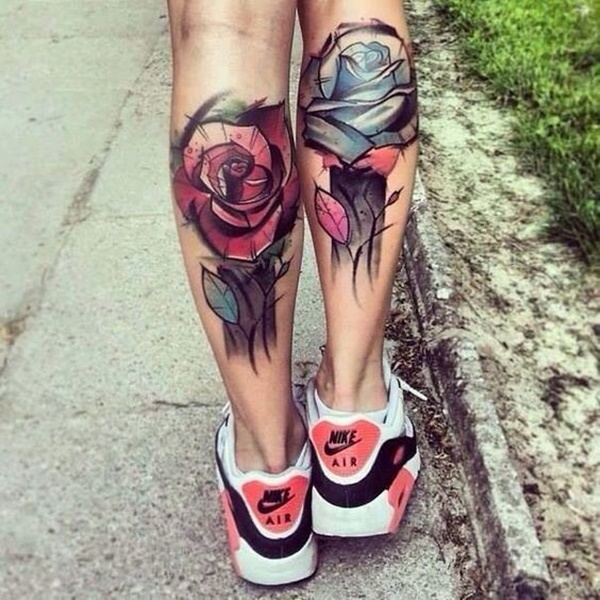 A white rose and a red rose are depicted on the wearer’s calves. 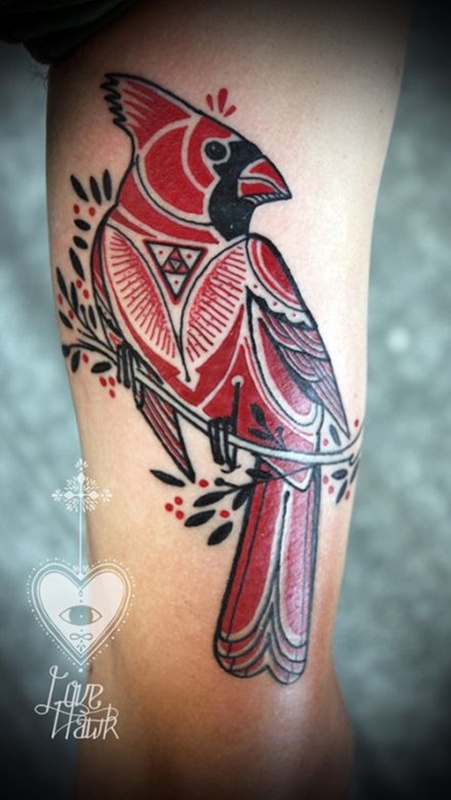 A stylized cardinal is seen in this tattoo. 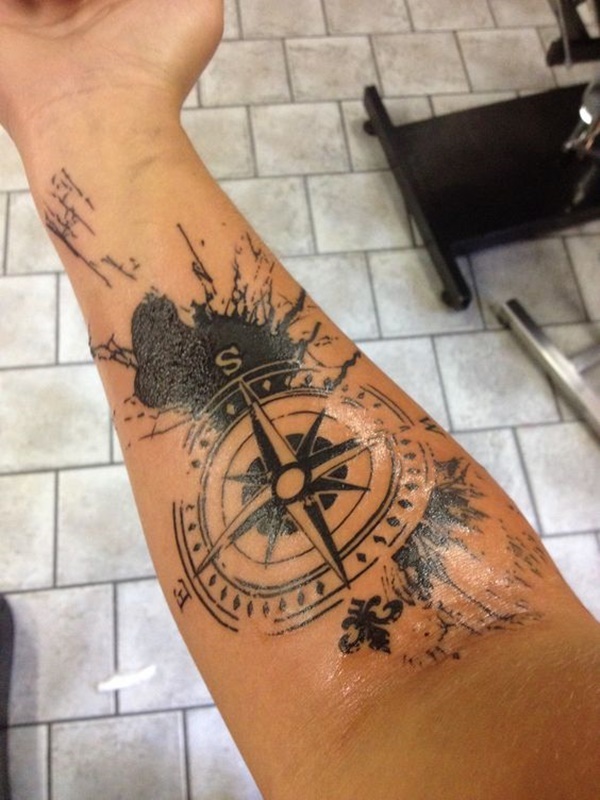 A black and gray rendition of a map and a compass. 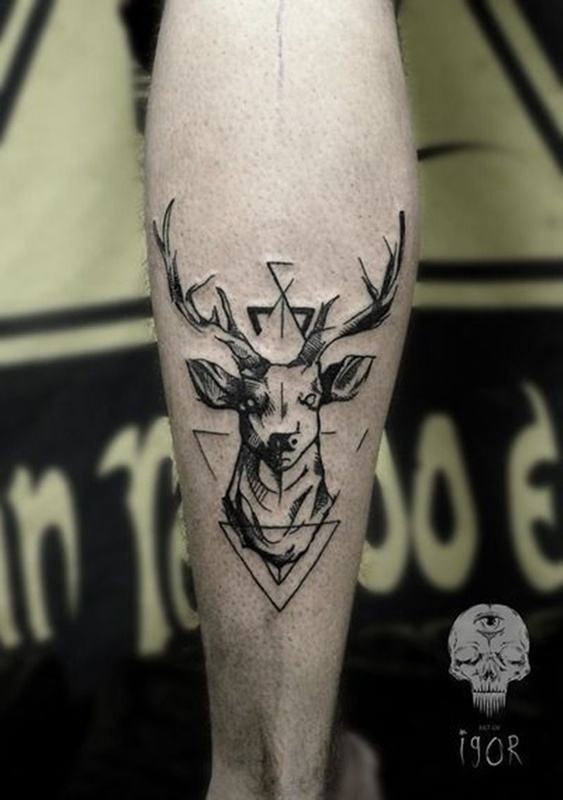 A buck is embellished with geometric designs. 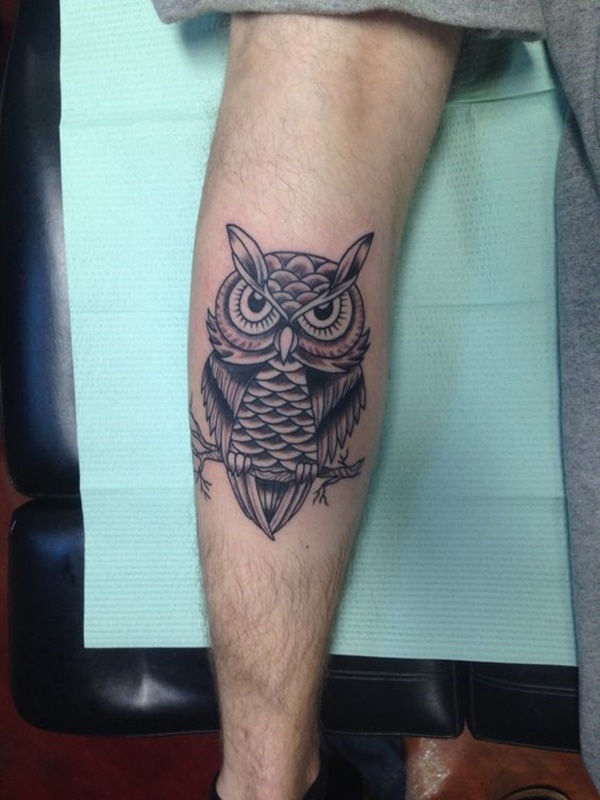 Another black and gray owl and skull tattoo. A stylized wolf is rendered over a pair of crossed branches. 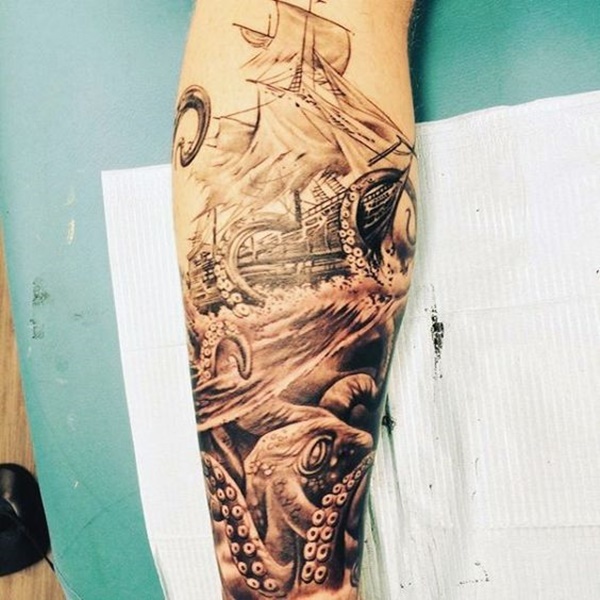 A black and gray depiction of an octopus attacking a sailboat. 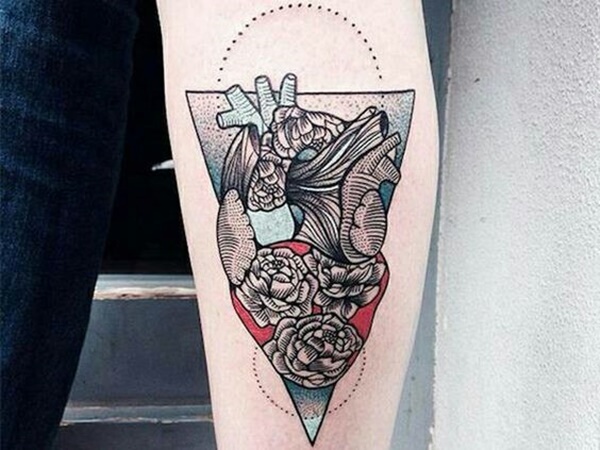 A tattoo that mimics torn flesh to expose the muscle underneath. 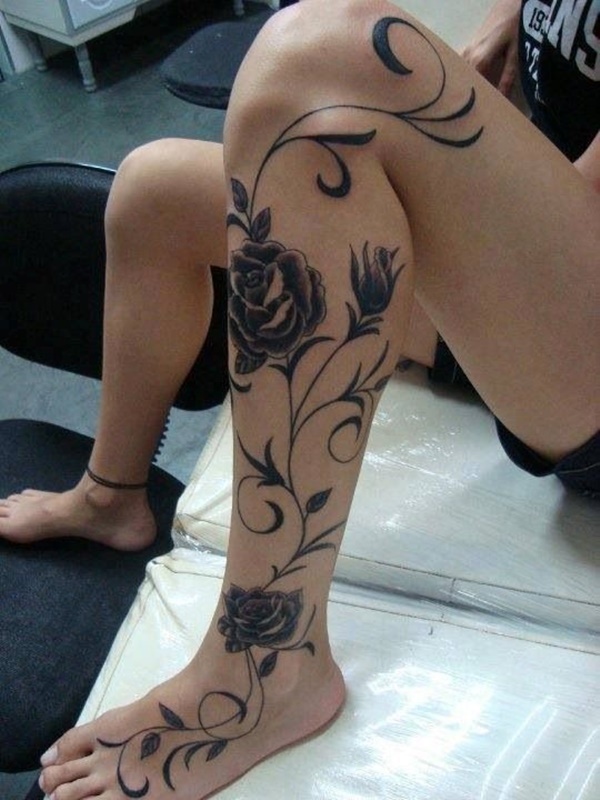 A unique black design adorns the wearer’s calf. 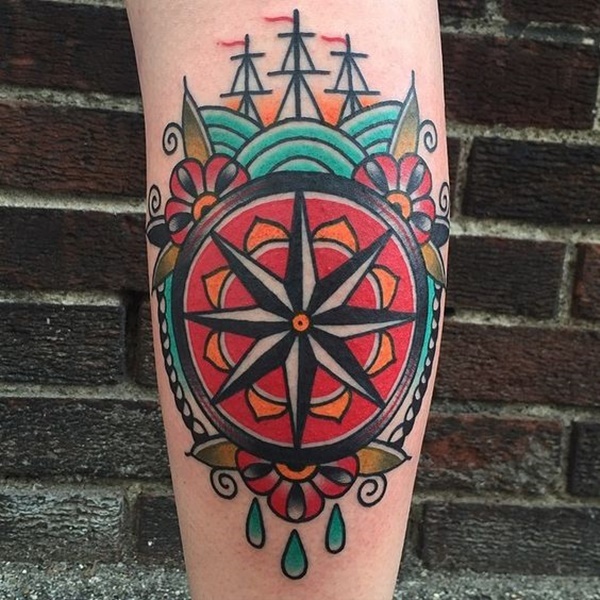 A compass is rendered in traditional styling and coloring. 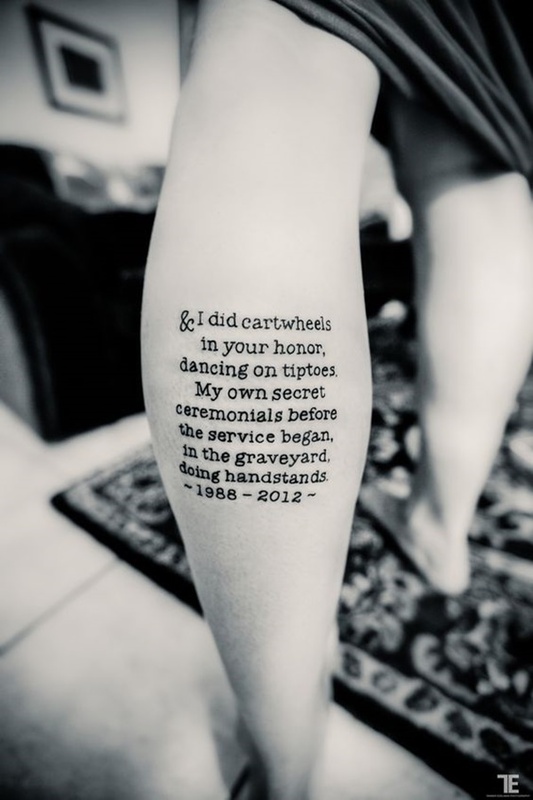 A quote runs down the wearer’s leg and is accompanied by a plethora of images. 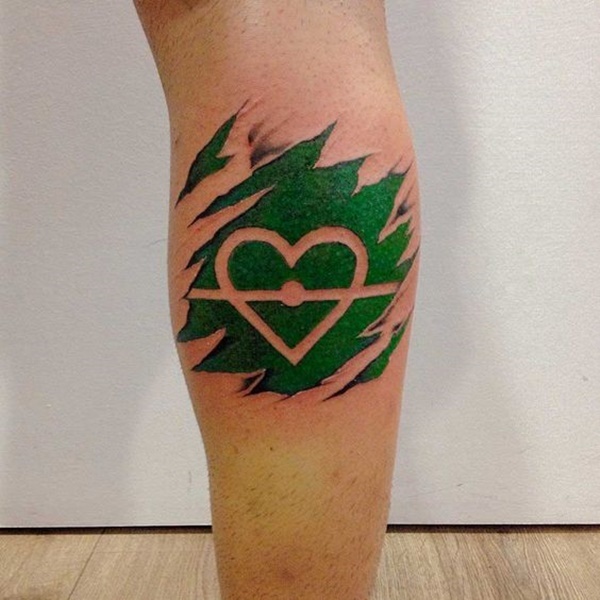 A heart is created using negative space over a green background. 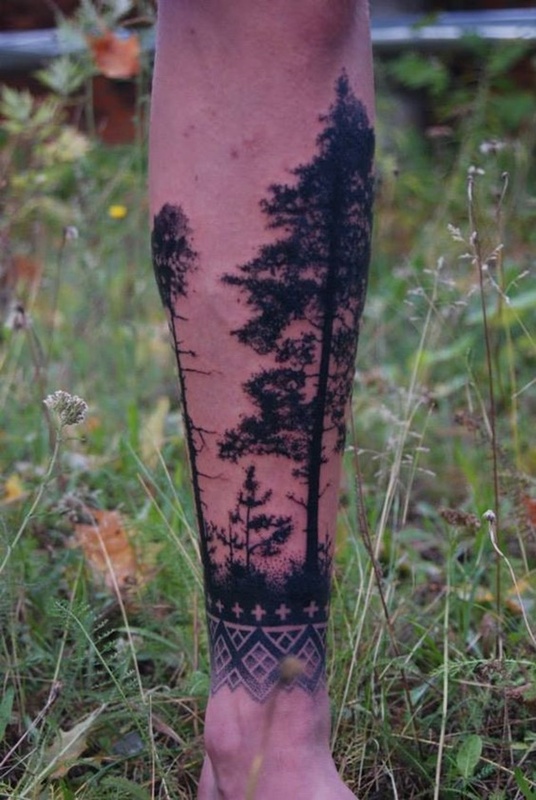 A tree stump and tree silhouettes are portrayed in black ink. 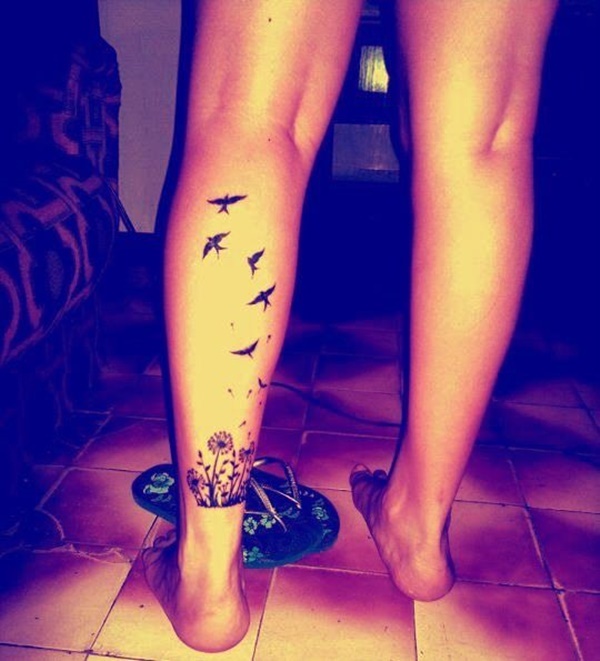 Silhouettes of flying birds and daisies are depicted in black ink. 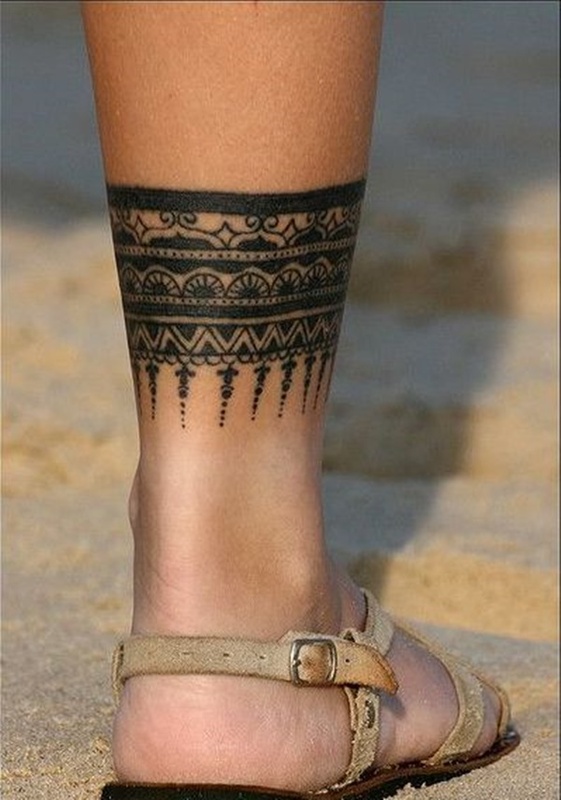 An anklet sports an elaborate pattern. 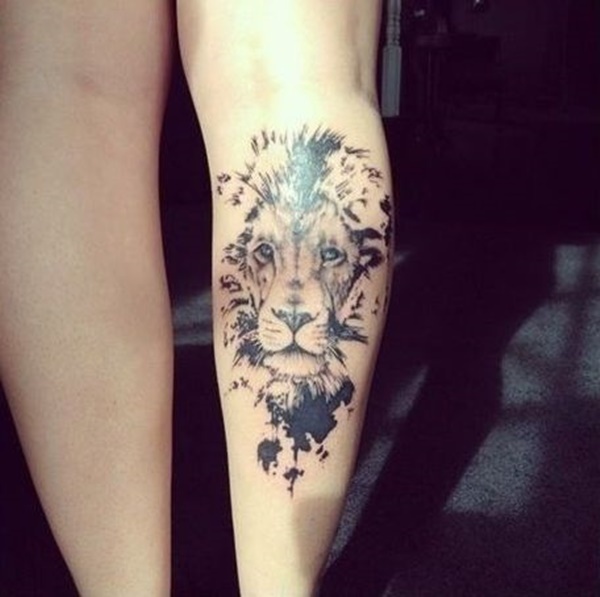 A lion portrait is accented with ink blots. 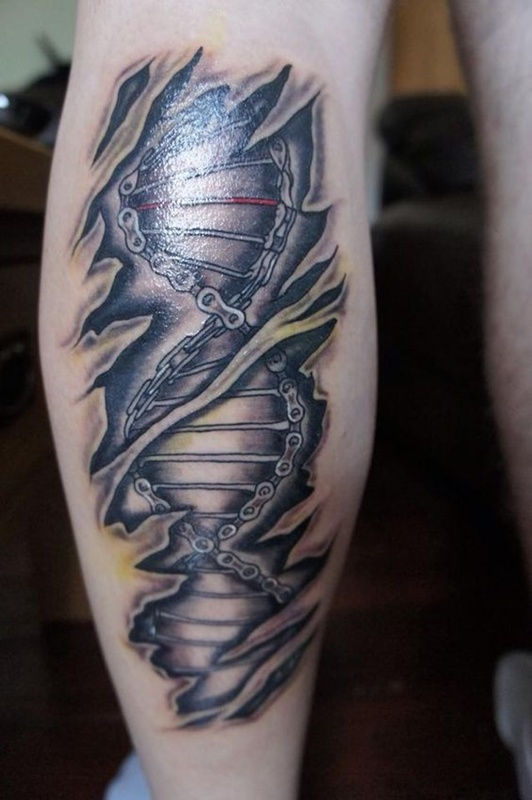 Torn flesh exposes a double helix comprised of a bike chain. 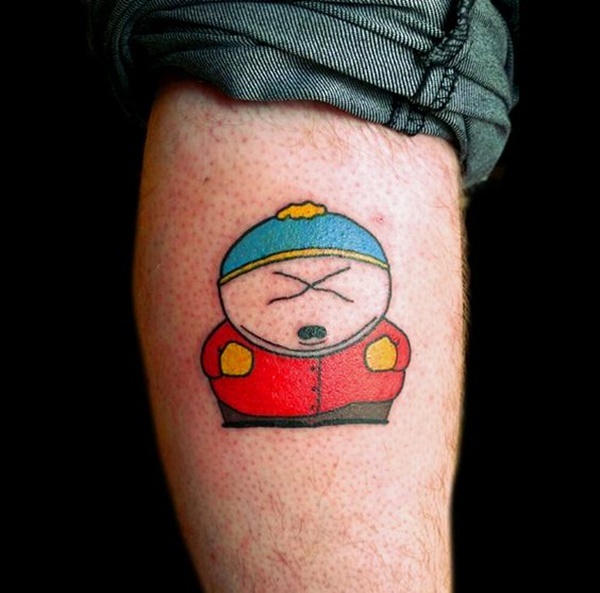 A vexed Cartman is rendered in color. A couple gazes at the moon through pine trees. 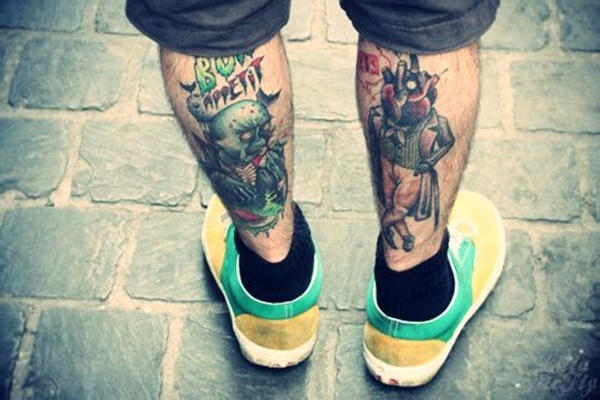 A moth is rendered on the wearer’s left calf. A butterfly is accented with hanging beads. 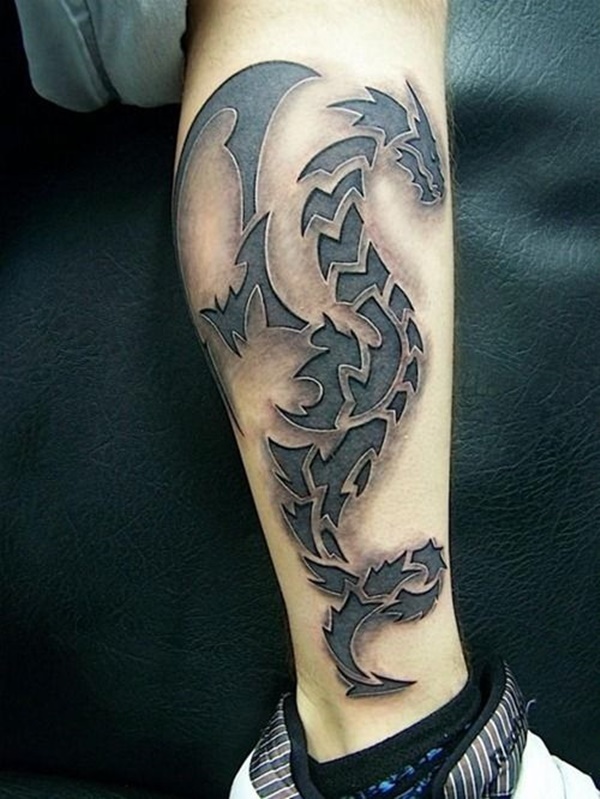 A stylized black dragon design is seen here. 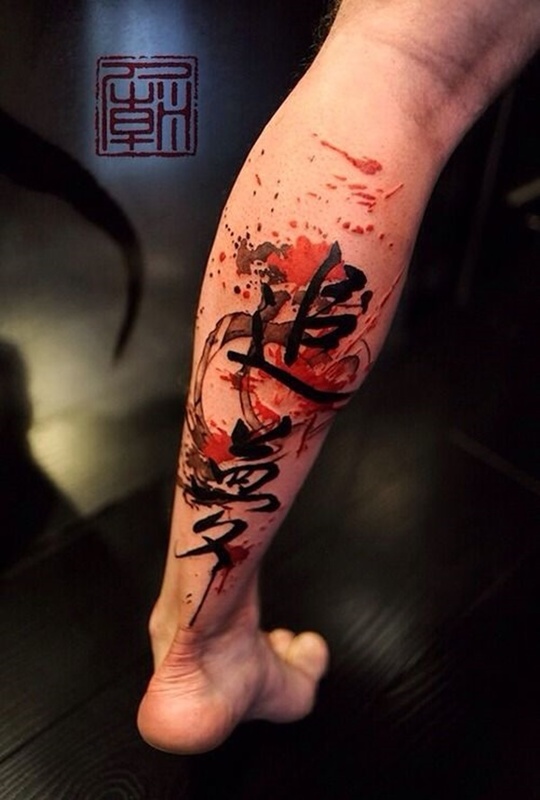 Japanese characters are rendered over blood splatter. 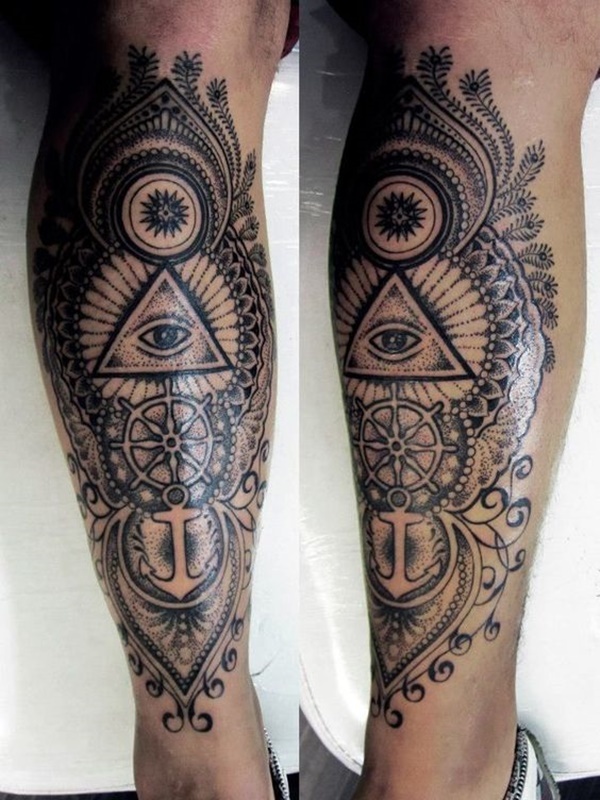 Nautical images are surrounded by an elaborate design. 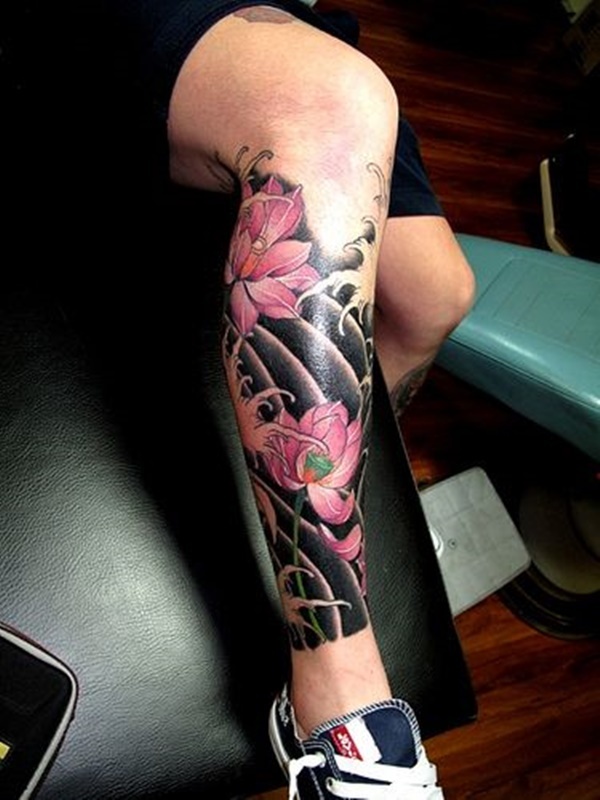 Colored flowers and black lace accompany each other in this tattoo. 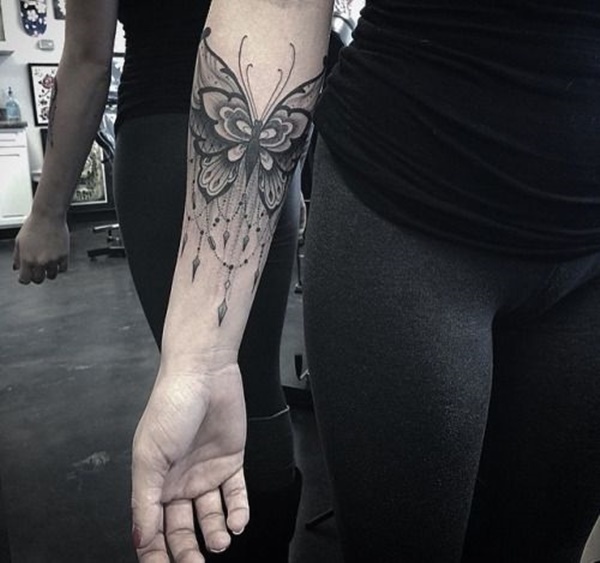 Black butterfly silhouettes ascend the wearer’s leg. A black and gray owl perched upon a branch is seen here. 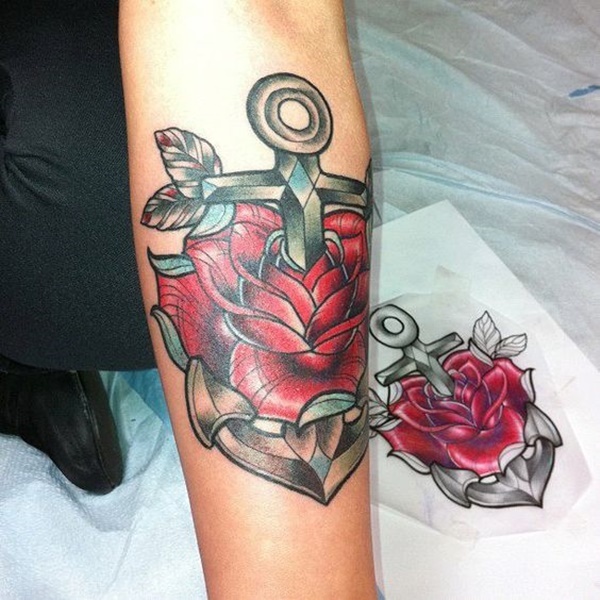 An anchor is woven through a rose in this tattoo. 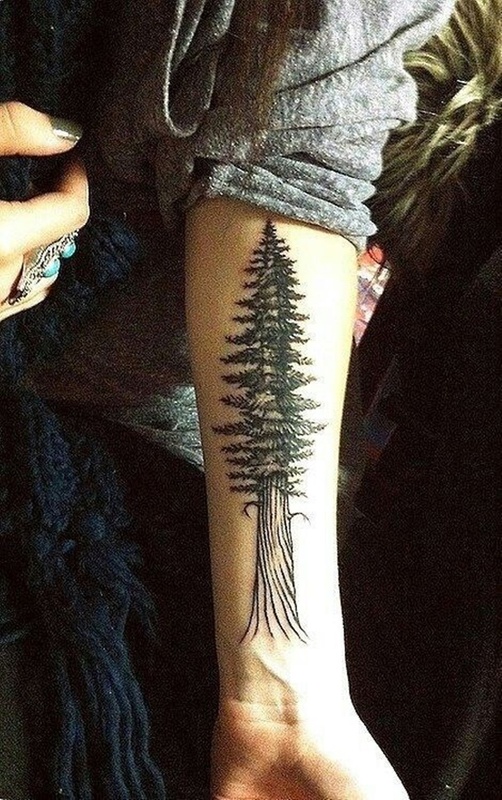 A pine tree with high branches is rendered on the wearer’s forearm. 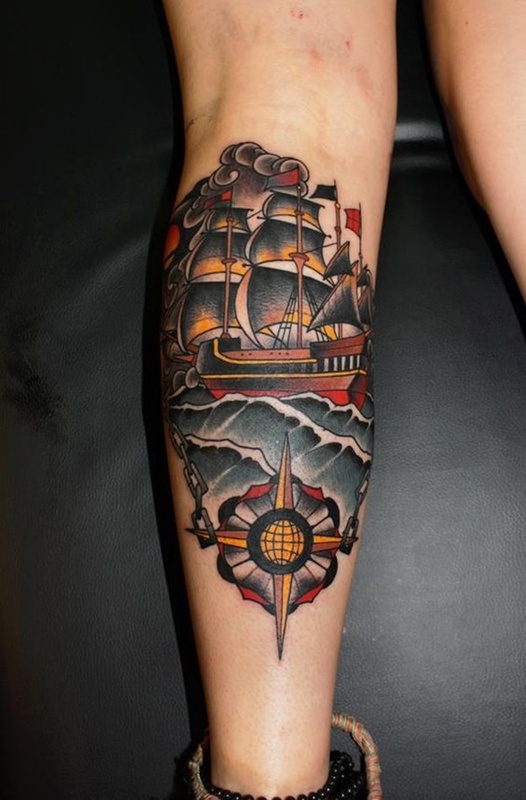 A traditionally styled and colored ship is depicted traversing the ocean while a compass sits at the bottom of the image. 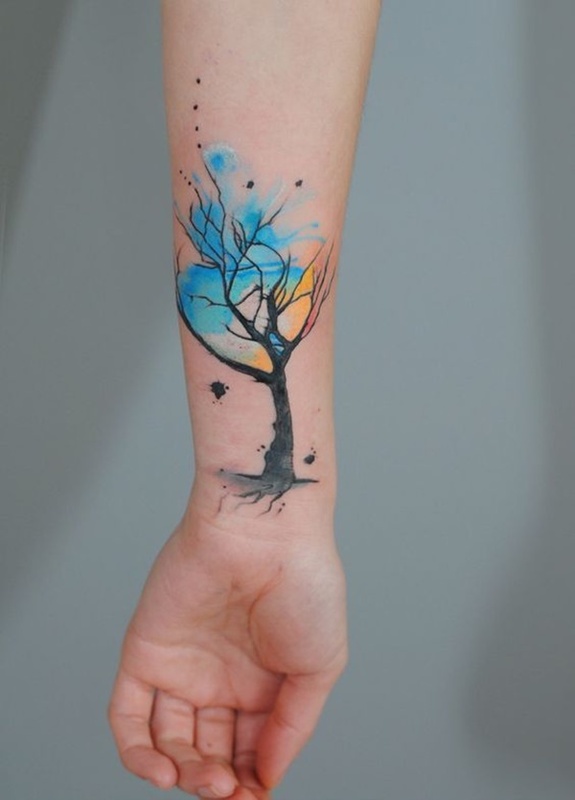 A black tree is accented with watercolor smears between the branches. A quote is spelled out in a courier-type font with a commemorative date underneath. 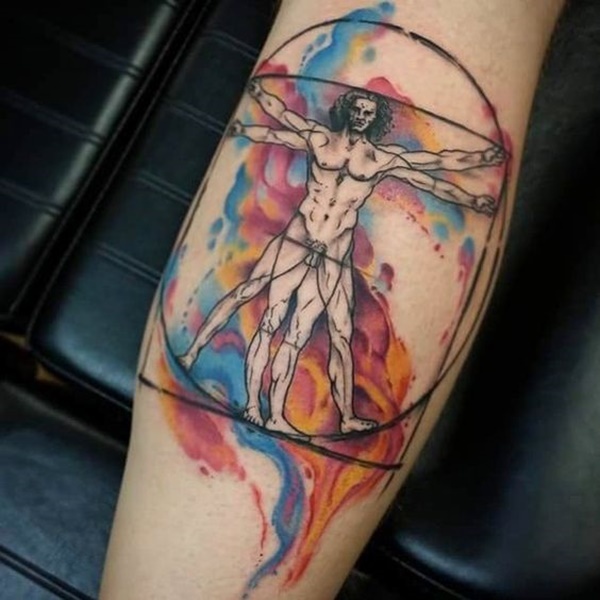 An anatomy drawing by Leonardo Da Vinci is accented with a watercolor smear. A jester is depicted in a pin-up pose and surrounded by stars. 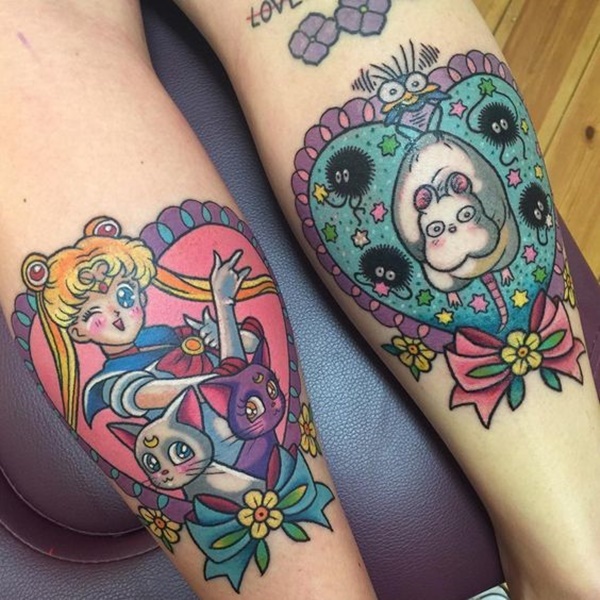 A couple of heart vignettes feature characters from the popular anime, Sailor Moon. 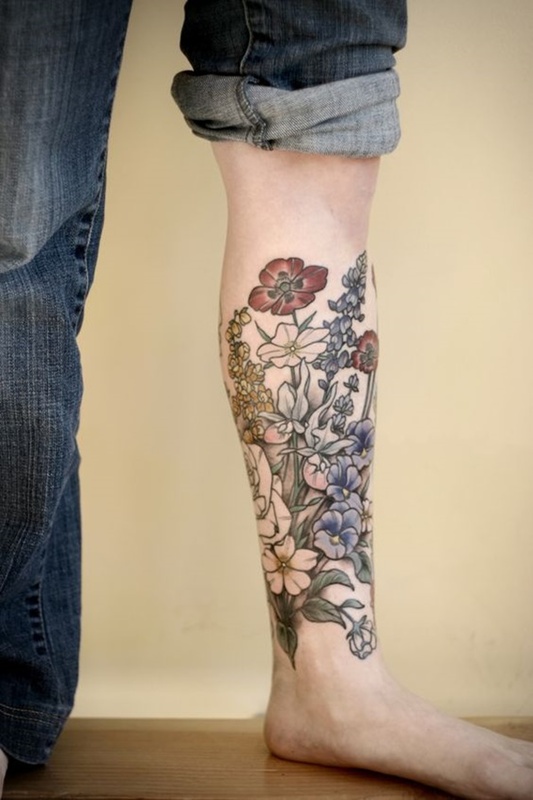 A group of wildflowers are depicted on the wearer’s calf. 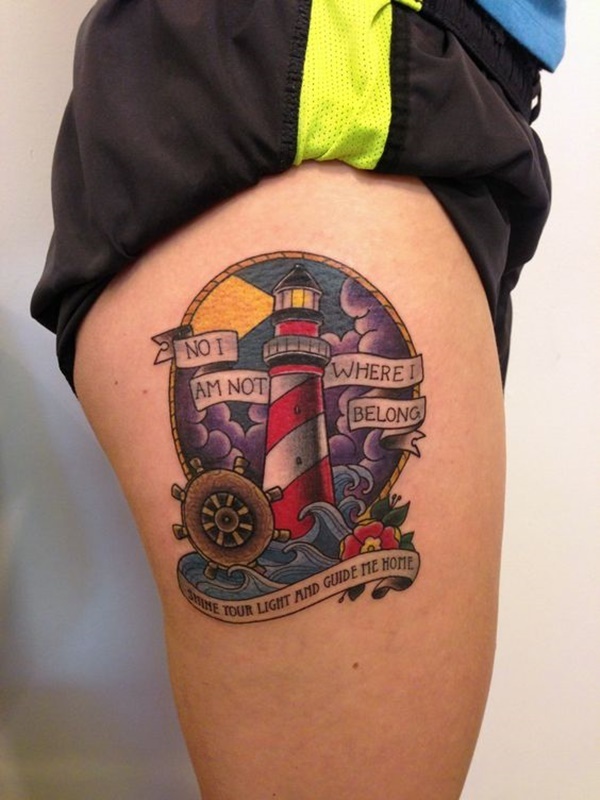 A lighthouse is contained in a circular vignette and accompanied by a quote. Elaborate mandala designs are accented with hanging beads. 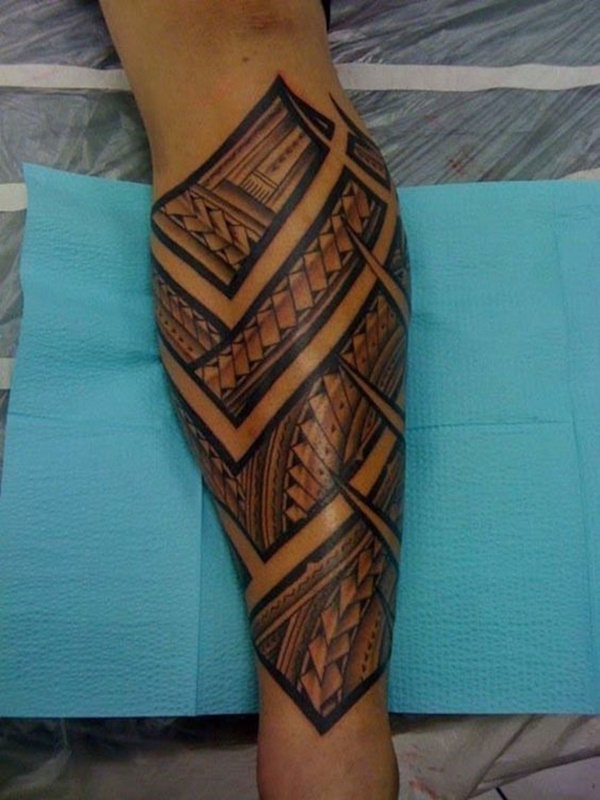 A tribal inspired design is made more complex with geometric shapes and shading. 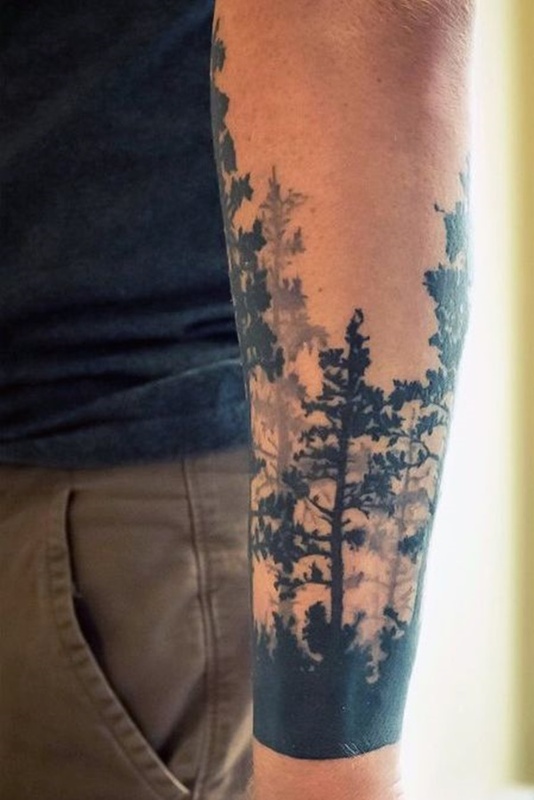 Black tree silhouettes wrap around the wearer’s forearm. 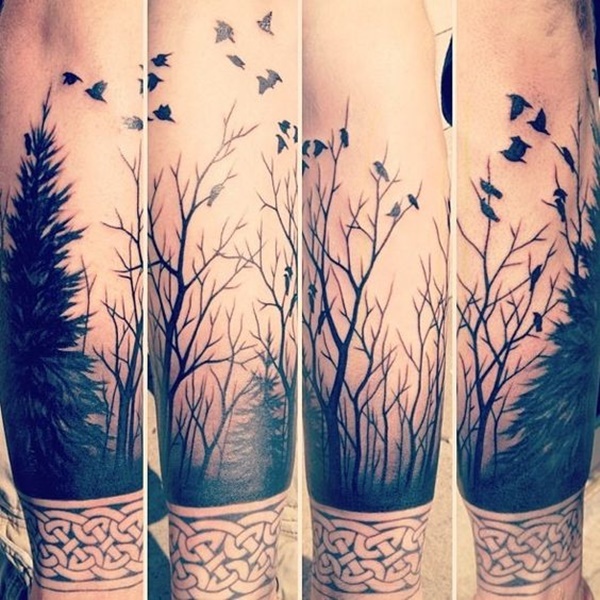 Black silhouettes of trees are accompanied by silhouettes of perched and flying birds. 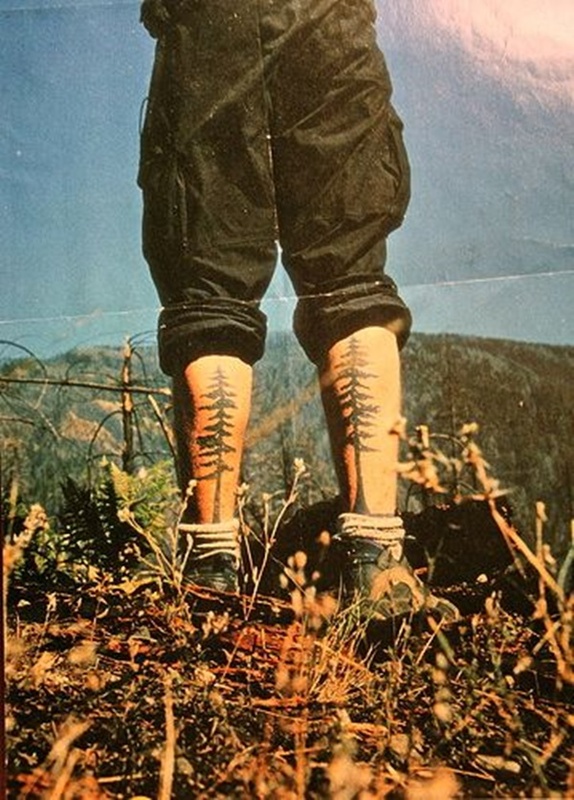 A pair of pine tree silhouettes adorn the wearer’s calves. 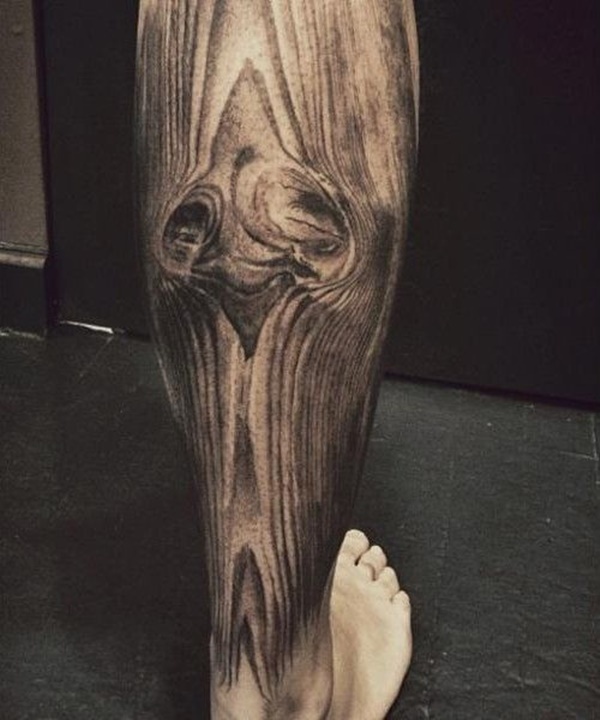 A wood grain sleeve covers the wearer’s leg below the knee. 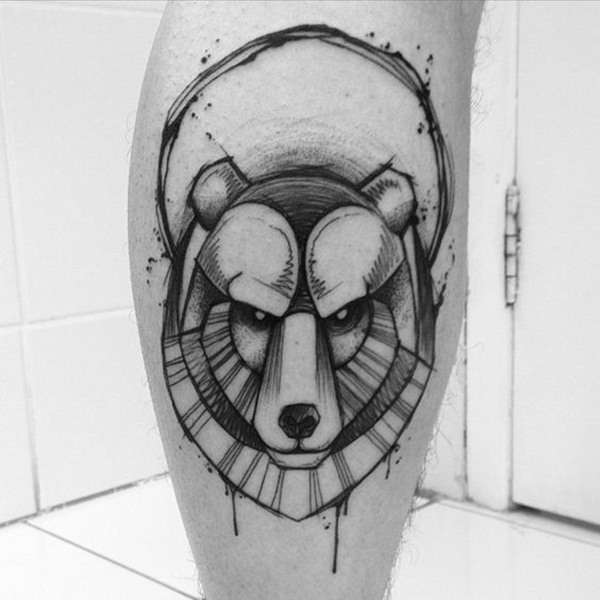 A stylized bear sketch is depicted in black ink. 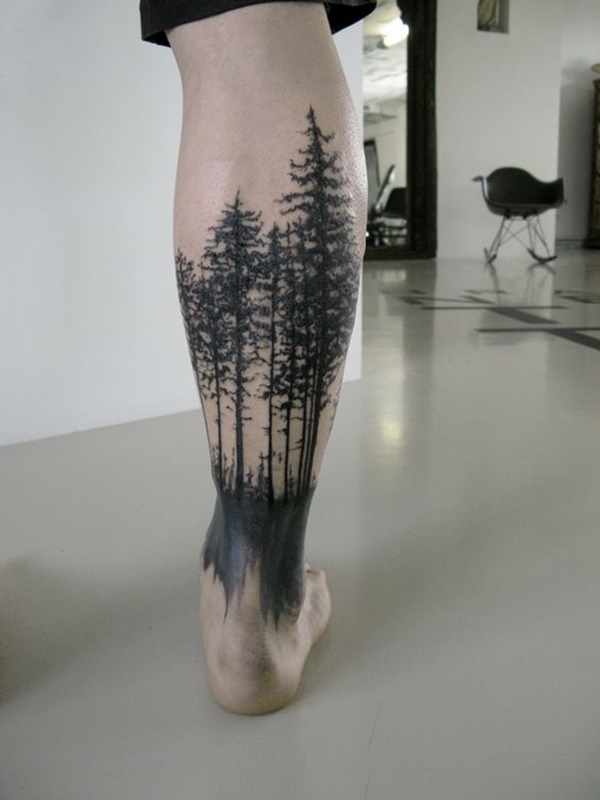 A silhouette of a forest is depicted in black ink. 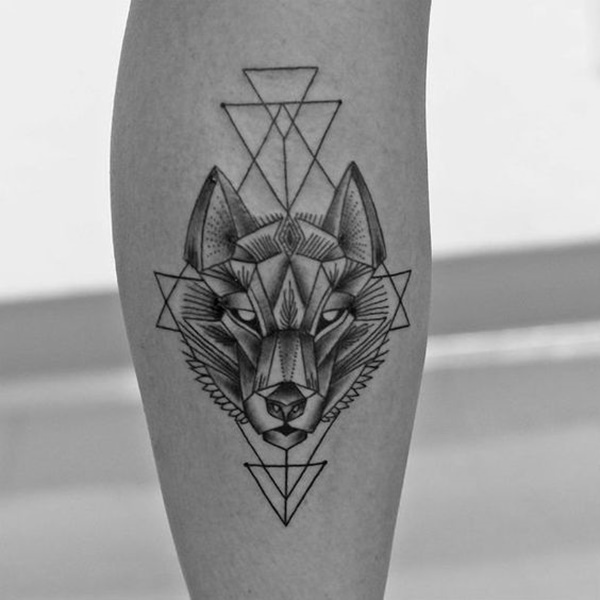 A wolf head is comprised of geometric shapes. A trio of roses are connected by scrolling design. 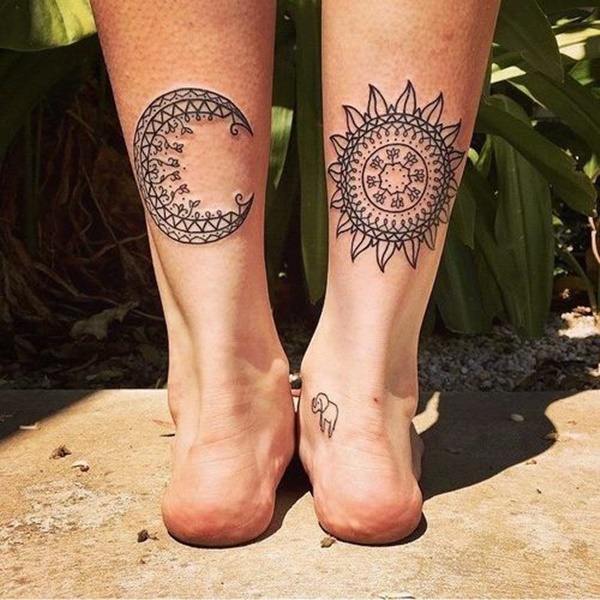 A crescent moon and a mandala are depicted on the wearer’s calves in black ink. 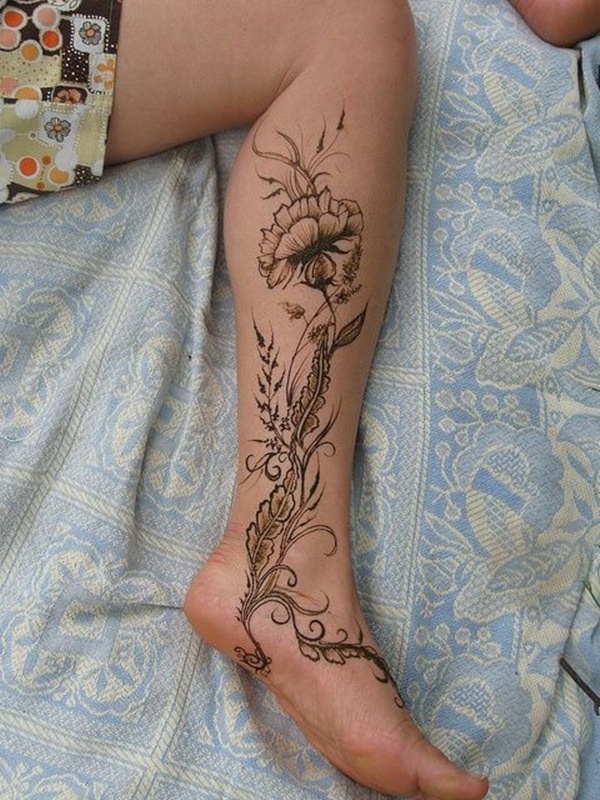 Various flowers are depicted in full color just above the wearer’s ankle bone. 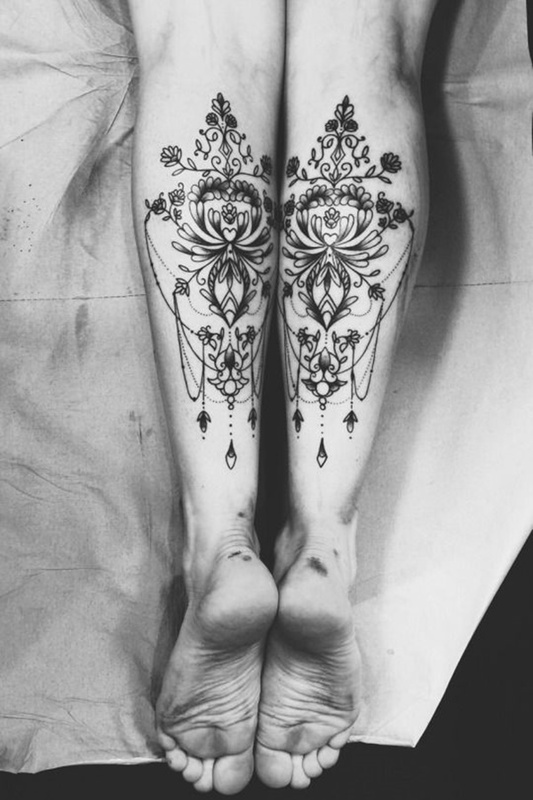 Negative space is used to create a spiky geometric shape above a collection of flowers. 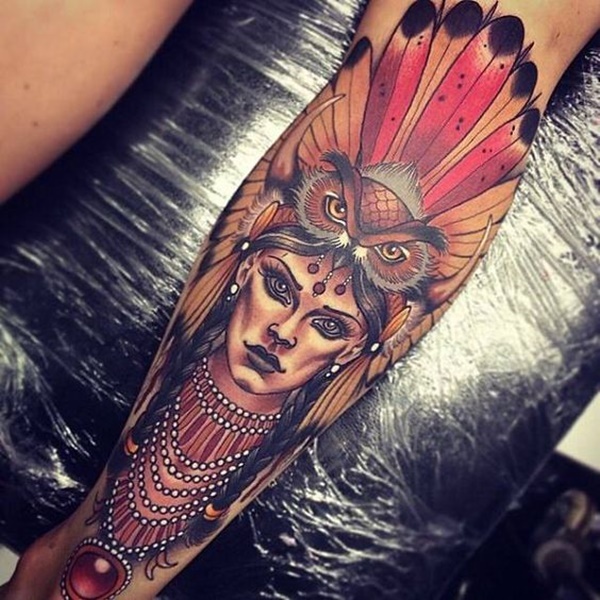 A woman is illustrated wearing an owl headdress. 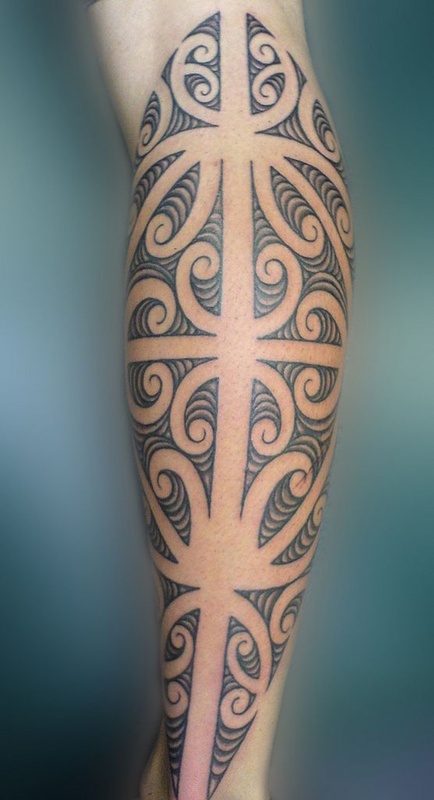 An ornate design is used to create a calf sleeve in black ink. Two islands are depicted with a fanciful design inside of them. An abstract smear of colors frames a portrait of a woman. 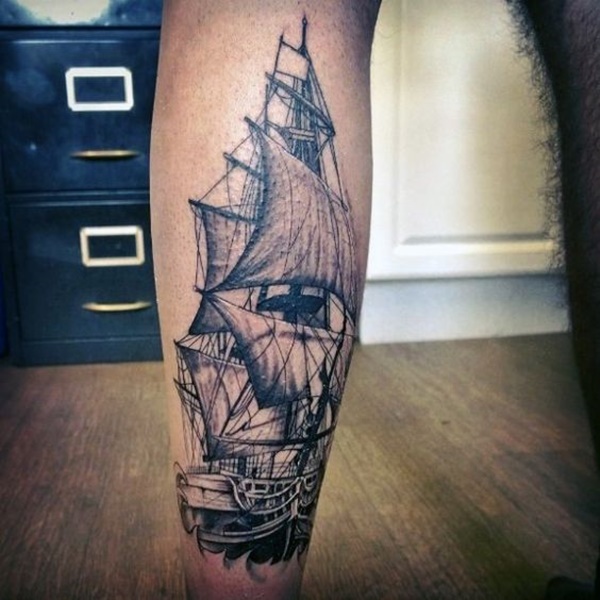 A hyper-realistic sail ship is depicted in black and gray ink. 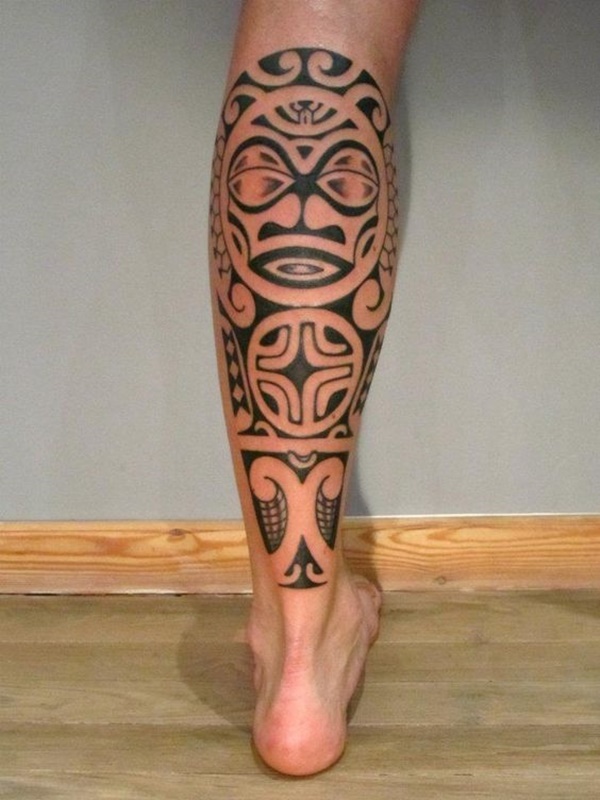 A tribal depiction of a turtle functions as the centerpiece of this tribal calf sleeve. 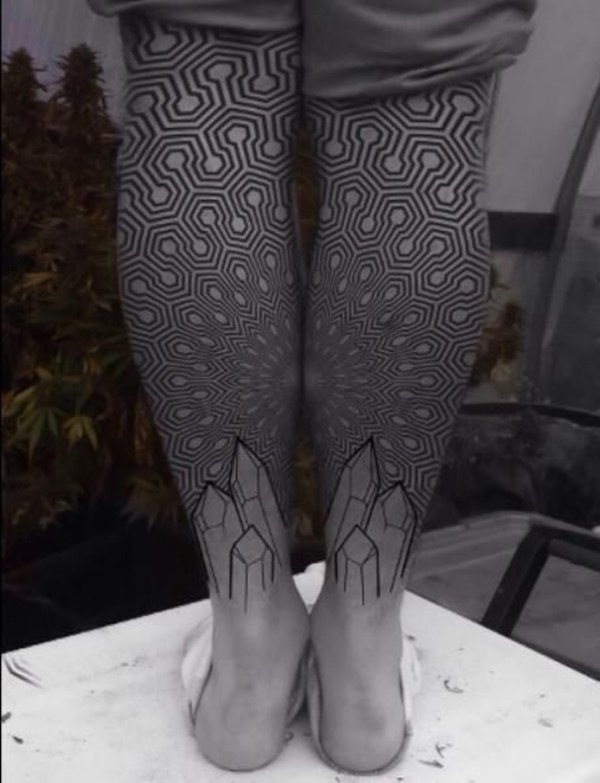 A mandala inspired design is portrayed on the wearer’s heels. 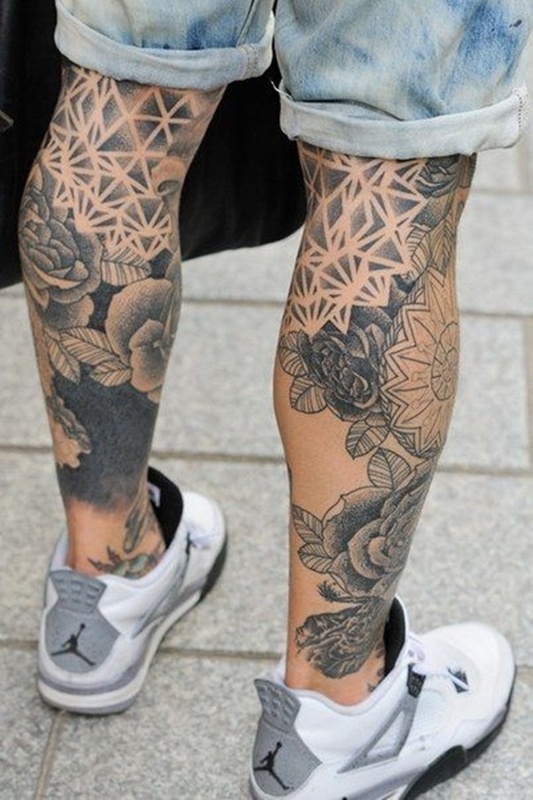 A honeycomb pattern is rendered across both of the wearer’s calves. 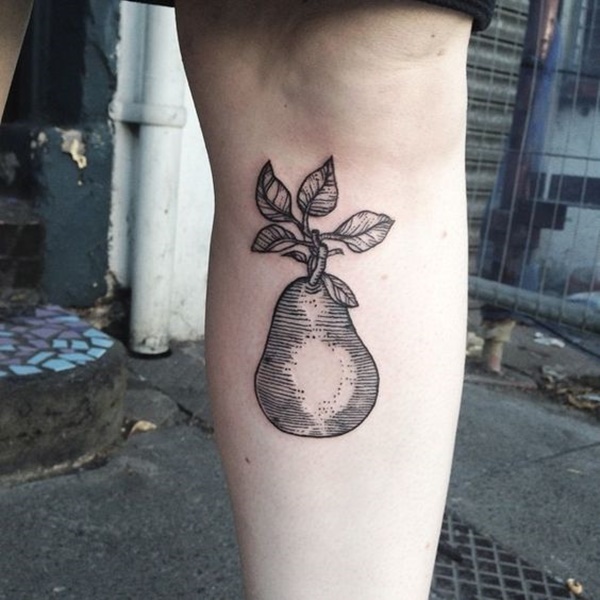 A pear is depicted in black and gray ink. 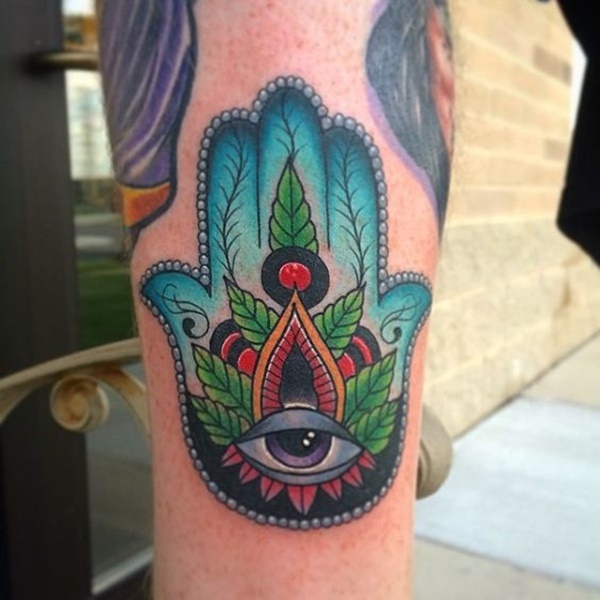 This colorful piece superimposes an eye over some foliage inside of a hand symbol. 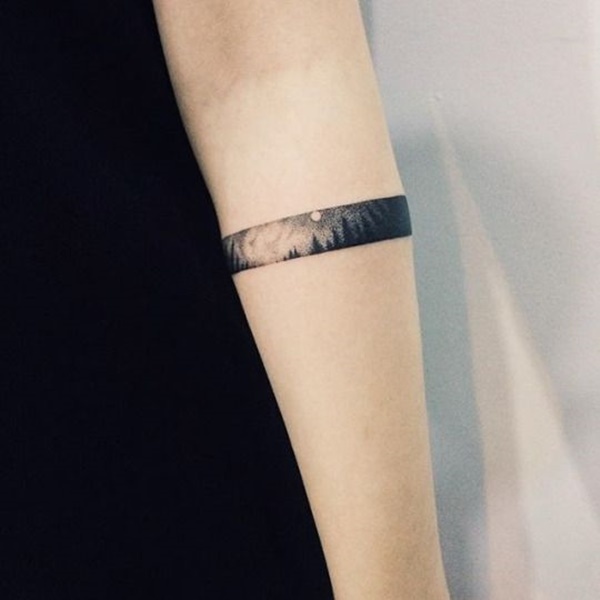 A pink ribbon is inked so to appear to be weaving underneath the wearer’s skin. Nature subjects are portrayed inside of a triangle in this piece. 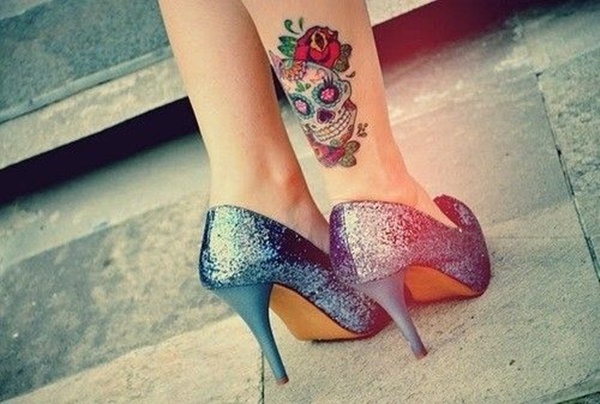 Crystals are portrayed just above the wearer’s heels while an elaborate pattern creates a sleeve up the wearer’s leg. 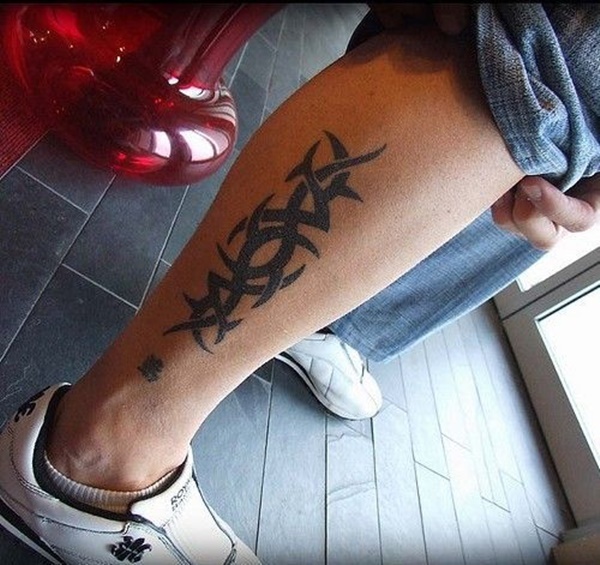 Black bands wrap around the wearers’ calves in this tattoo set. 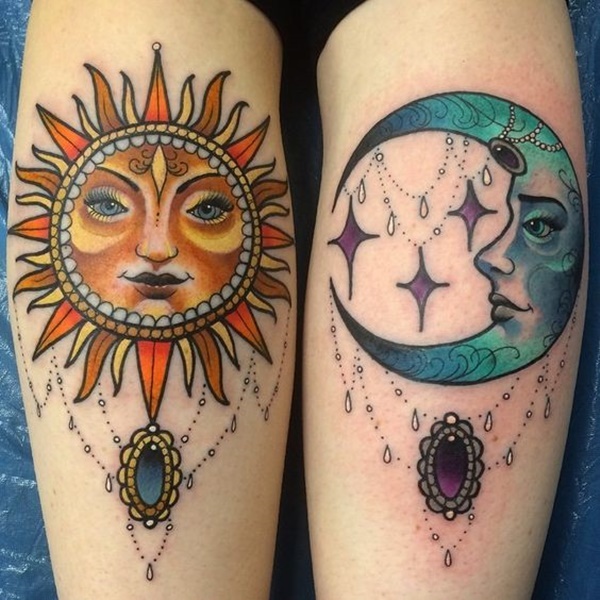 Colorful renditions of the sun and the moon are accompanied by gemstones. 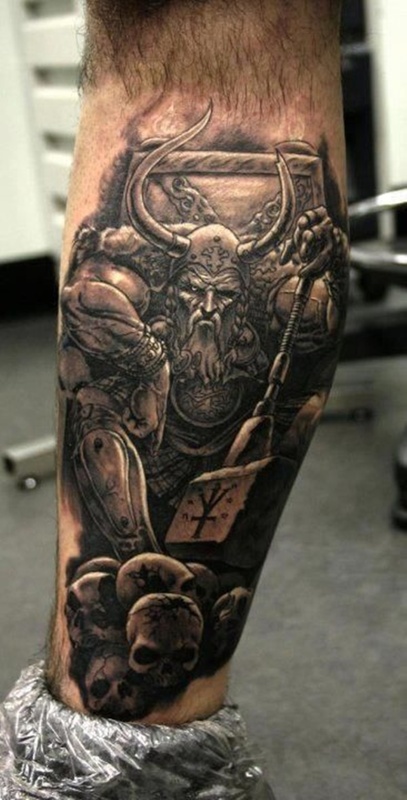 A viking sits on a throne with a pile of skulls at his feet in this tattoo. 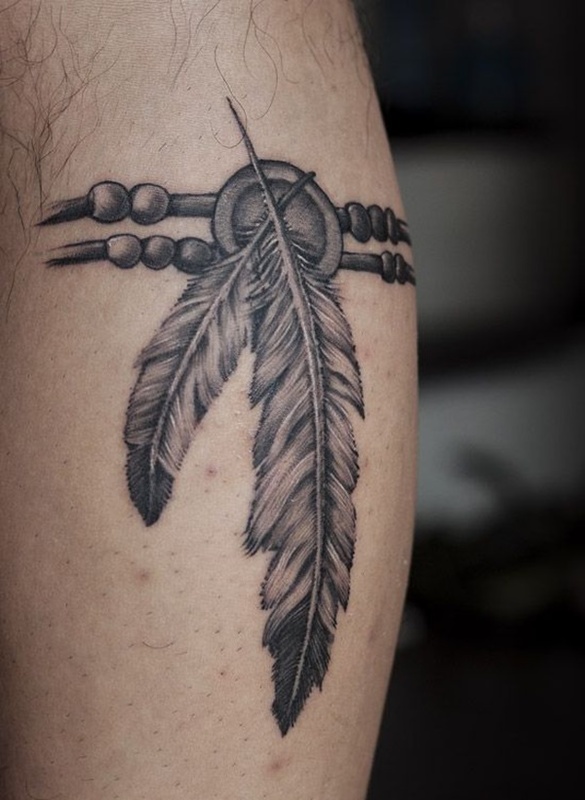 A pair of feathers are stranded together with a string of beads. 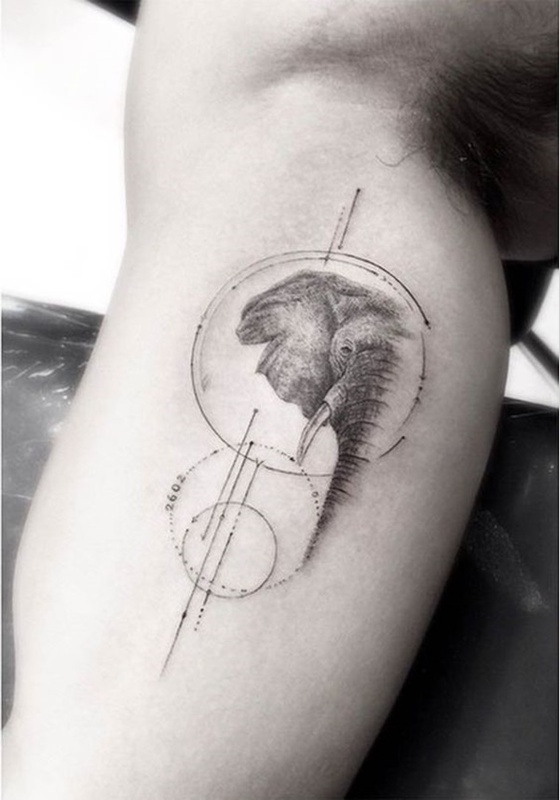 A circular vignette contains the portrait of half an elephant head.